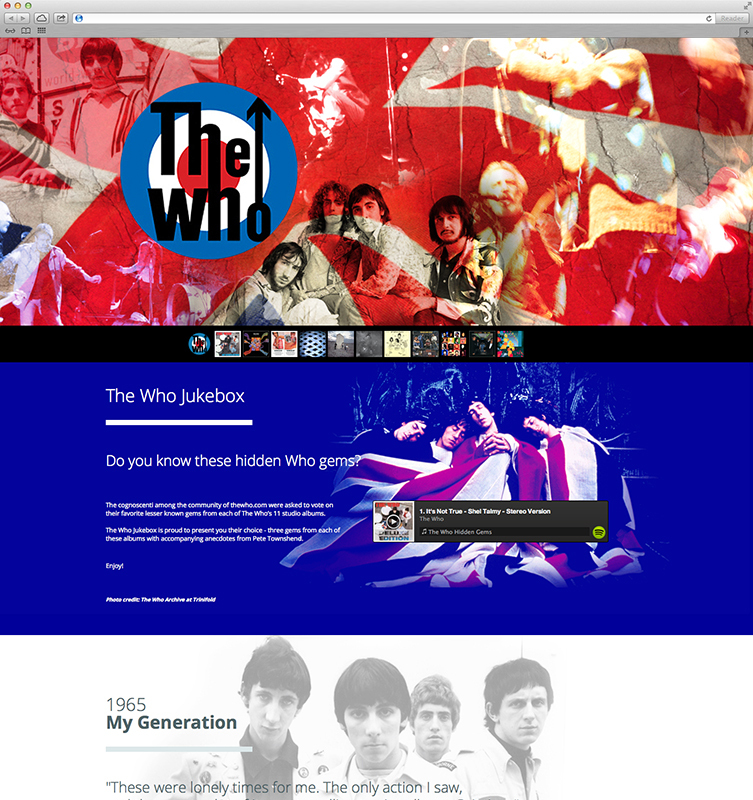 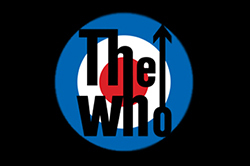 The Who jukebox is a responsive site designed to be viewed on tablets, featuring HTML5 / Spotify players for the mobile experience. 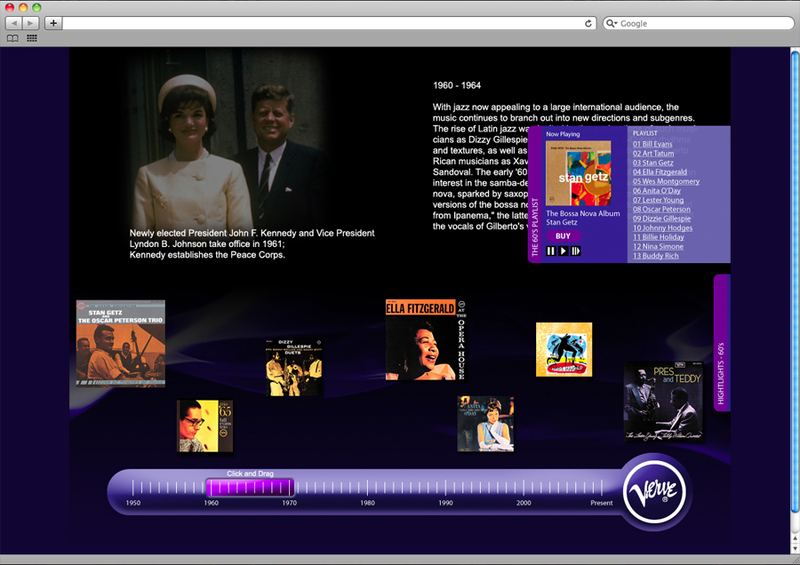 The goal of the site was to commemorate the band's 50th Anniversary and to hightlight songs from the band's long career that don't normally get the same attention as their pop hits. 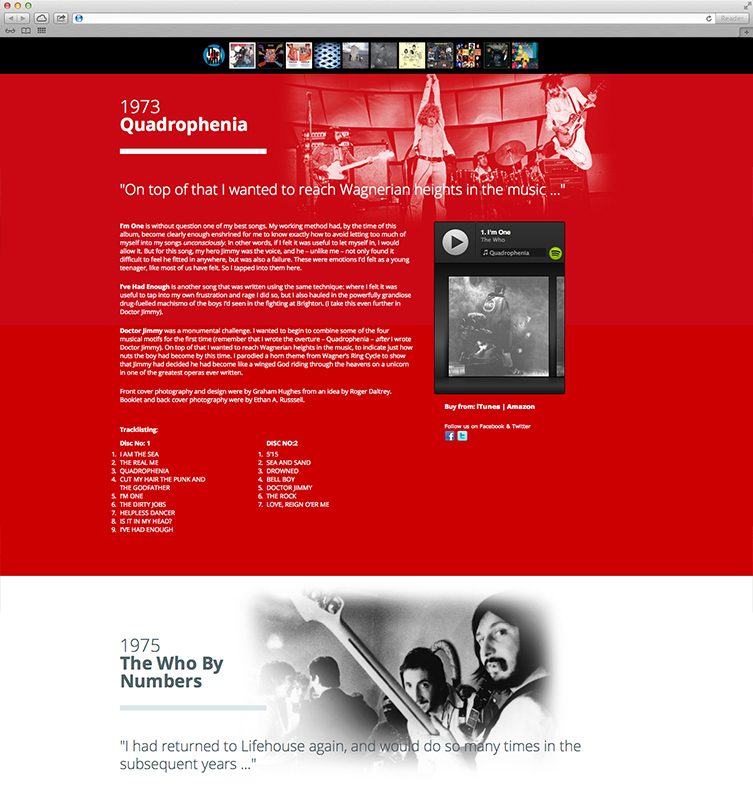 Pete Townshend provided personal insight for each highlight. 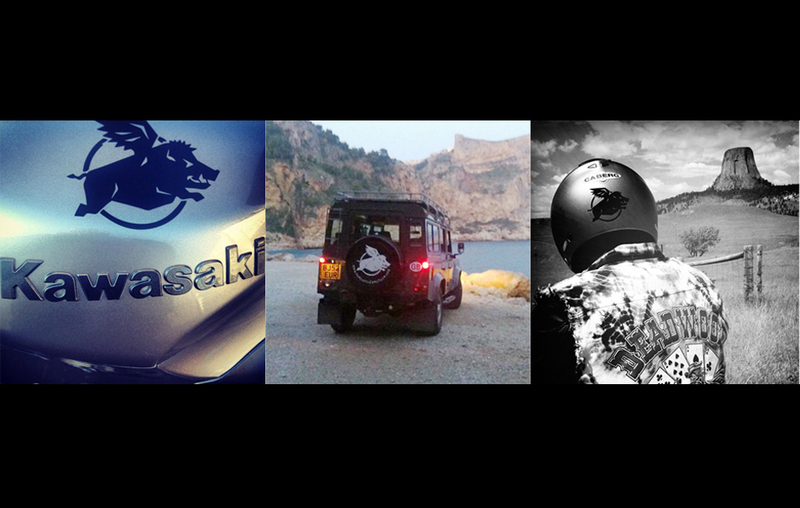 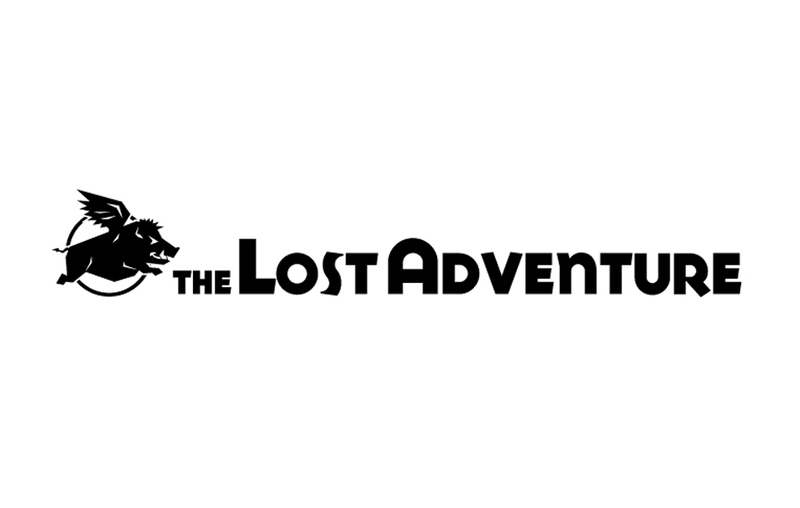 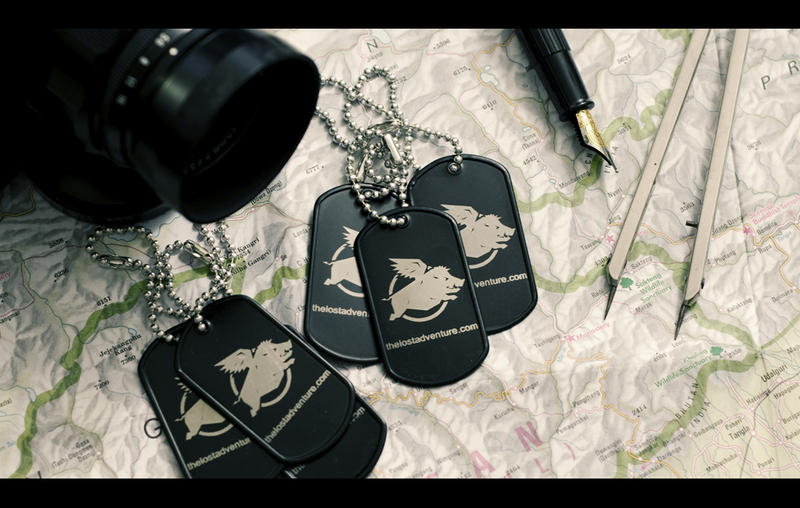 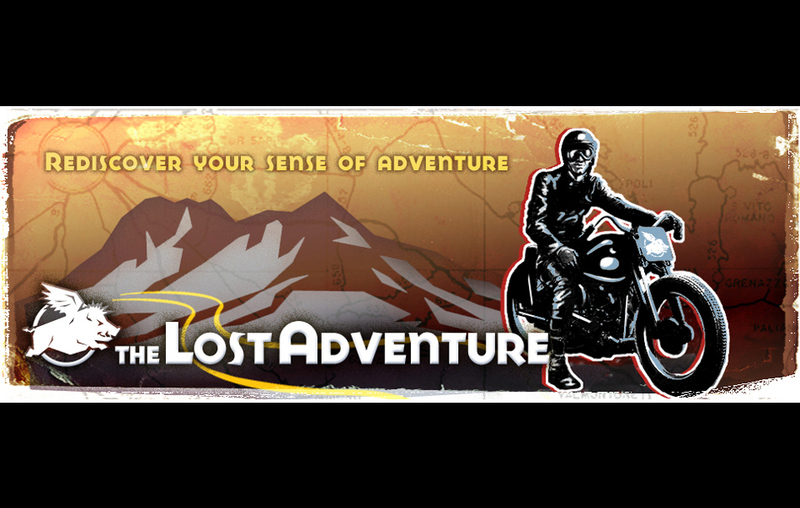 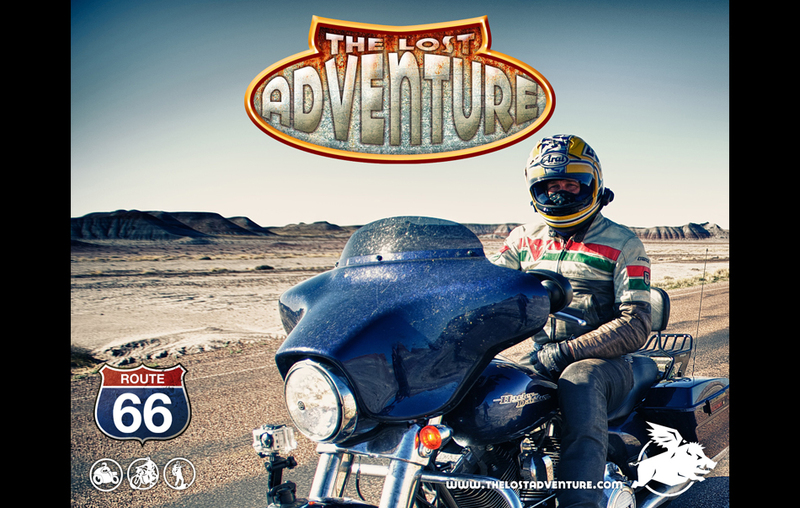 Comprehensive branding, design, online and offline marketing project for UK motorcycle adventure travel company The Lost Adventure. 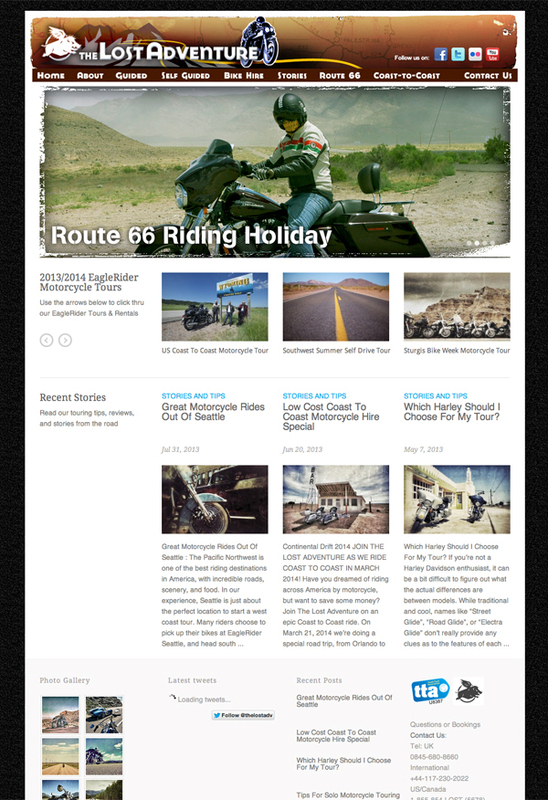 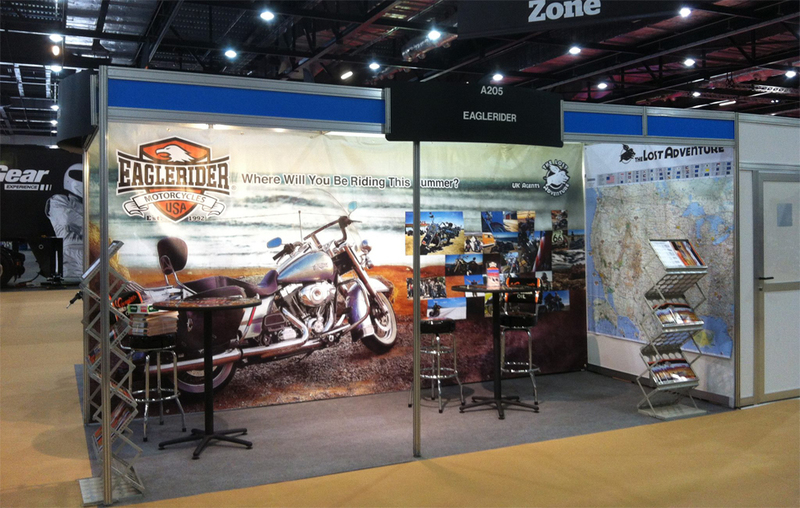 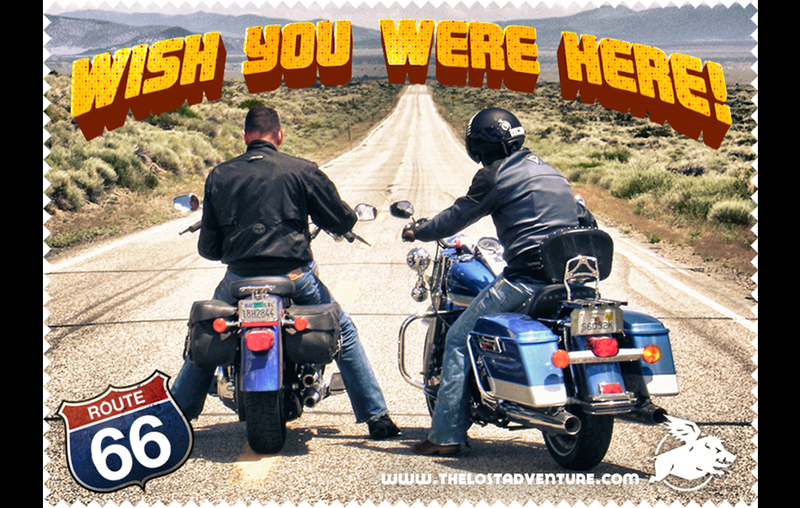 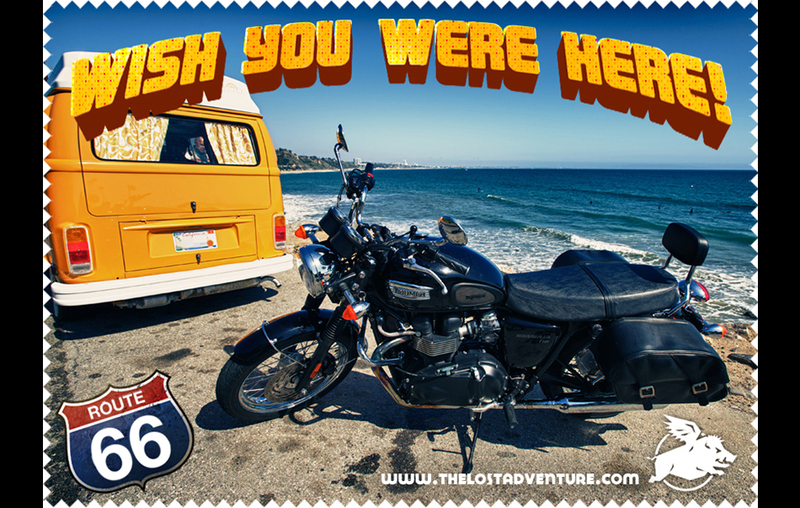 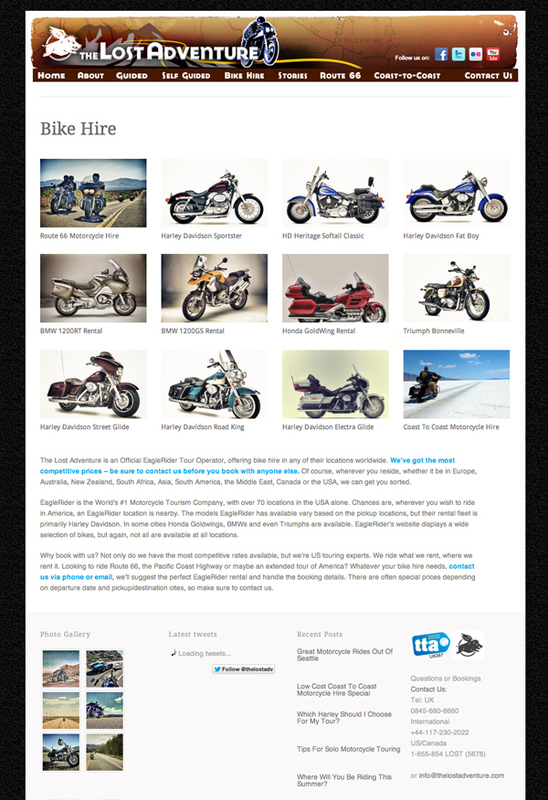 The company caters to foreign motorcyle riders interested in classic American roadtrip routes like Route 66, Salt Flats and scenic Westcoast Highways. 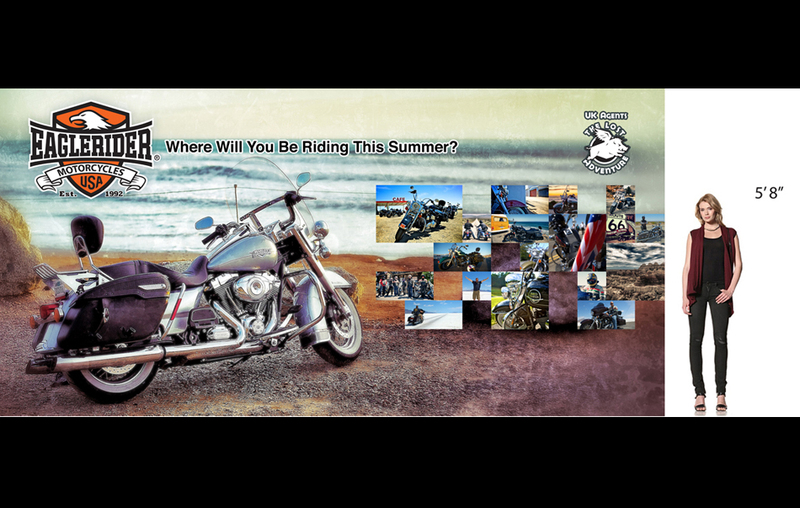 The typical TLA client are in their late 30's to 60's, professionals, looking to recapture their "wild hogs" days, however the person booking these trips are often wives and girlfriends treating their significant other to a "bucket list" vacation. 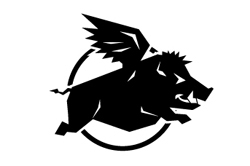 The "Flying Boar" logo is designed to be masculine without being threatening to women who might be booking these trips; the flying boar is also inspired by the indonesian mythological flying boar the protector of dreaming children (in this case the protector of the dreams of The Lost Adventure). 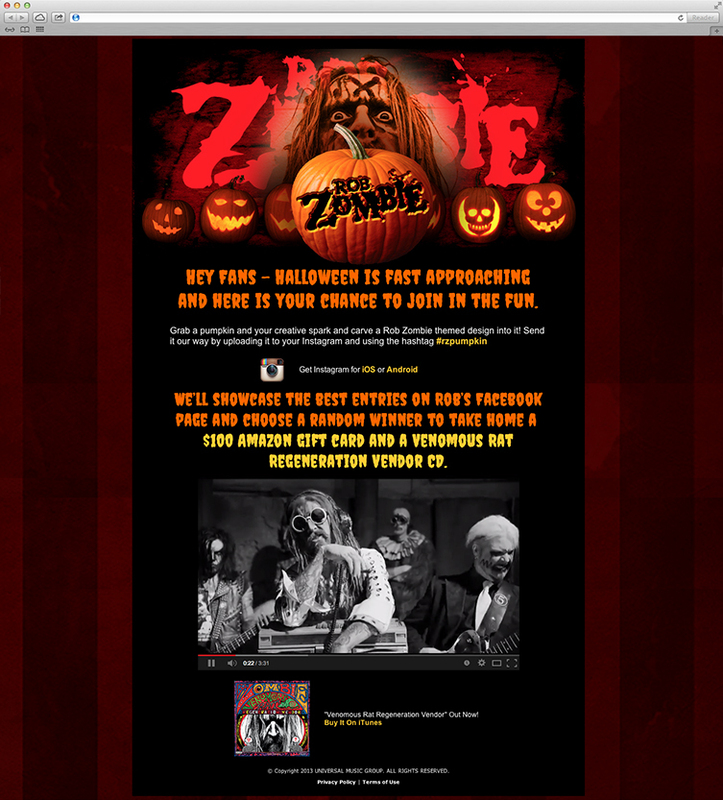 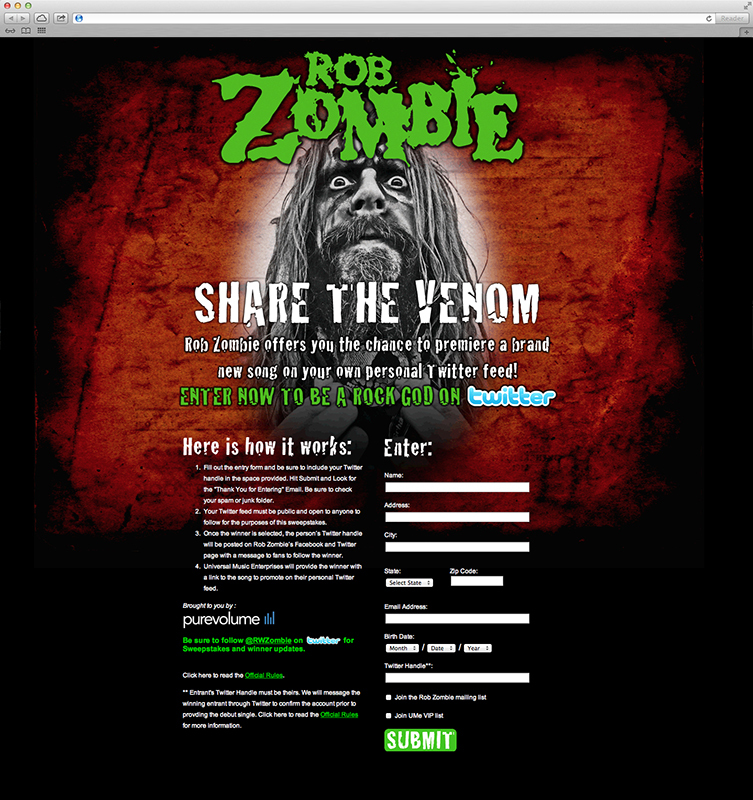 The launch campaign for Rob Zombie's new album Venemous Regeneration Vendor included promotions across the social networks. 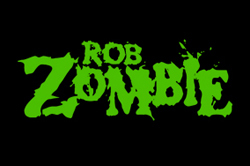 Viral compaigns on Instagram and Twitter drove awareness for the new album and Rob's new movie The Lords of Salem which was released at the same time. 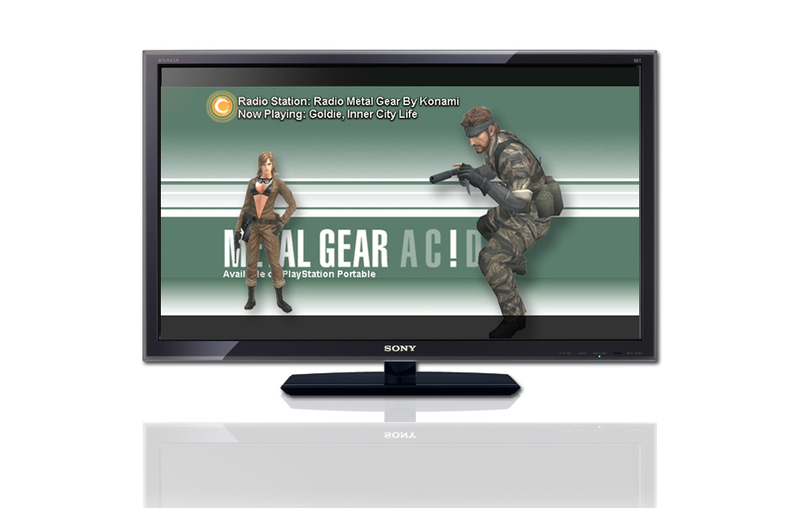 Pre-order campaigns on Facebook drove early sales. 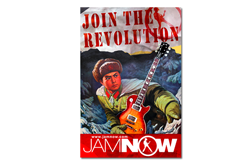 Awareness campaigns continued after the album launch with user generated content and fan participation contests. 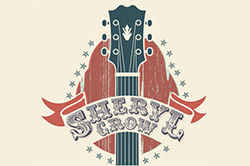 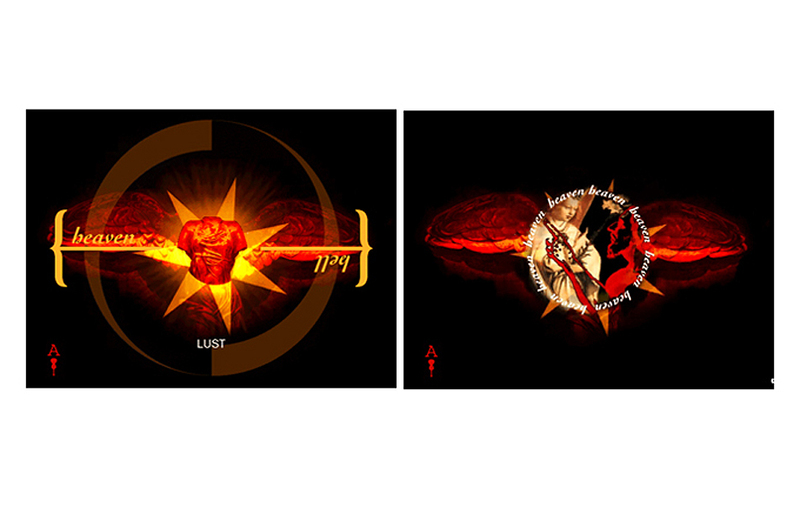 T-shirt logos designs for Sheryl Crow's U.S. tour. 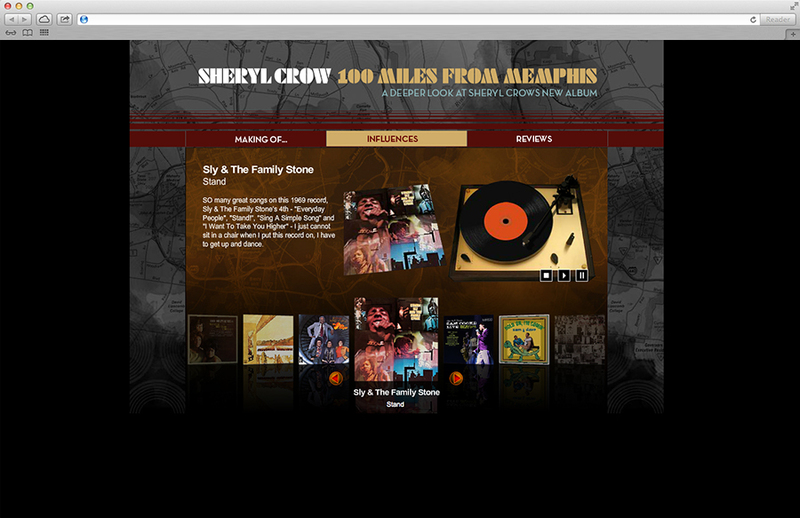 Sheryl Crow online jukebox profiling her musical influences leading up to the production of her 100 Miles From Memphis album. 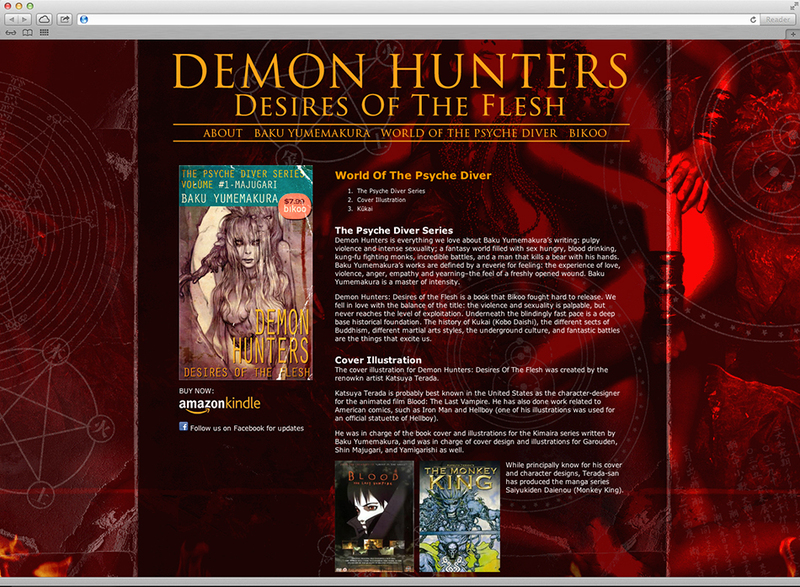 Demon Hunters - The Psyche Diver Series is the first english translation of Baku Yumemakura's books, released in digital form by Bikoo. 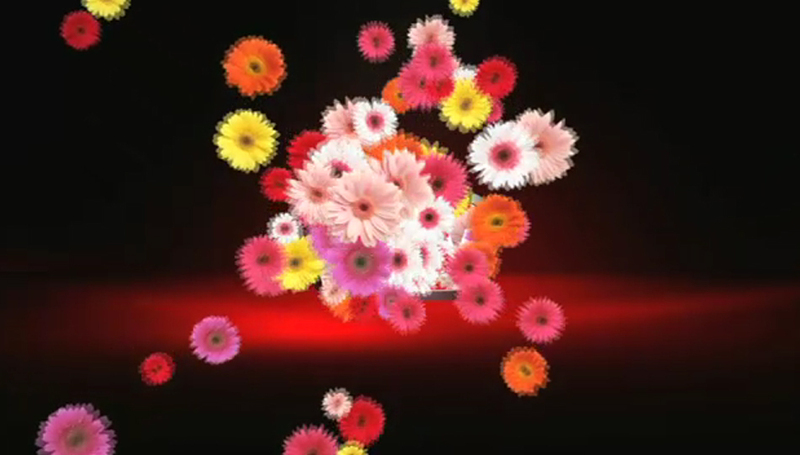 The author Baku Yumemakura is a prolific writer with hundreds of books published in Japan, many of which have been adapted for film, television and serialized comics. 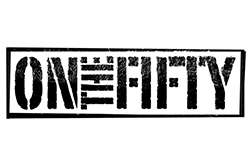 This website is designed to introduce the Demon Hunters series to a western audience who might be familar with his adapted films but not his written works. 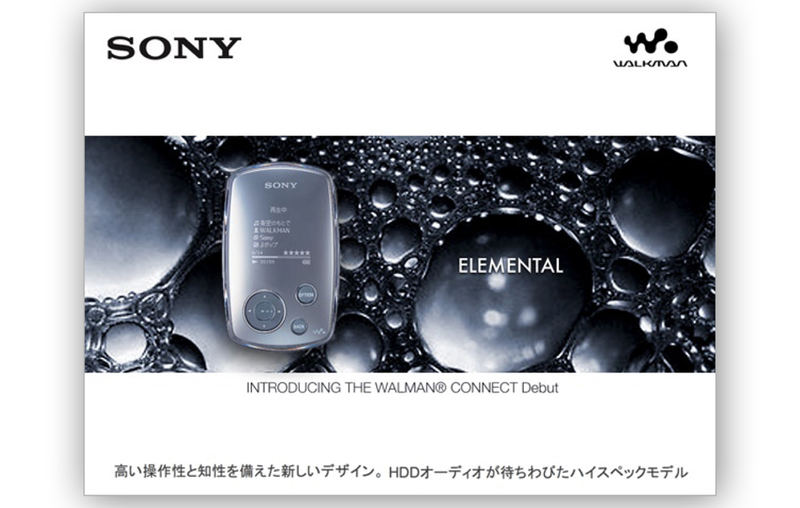 Cover art is provided by the great illustrator Katsuya Terada. 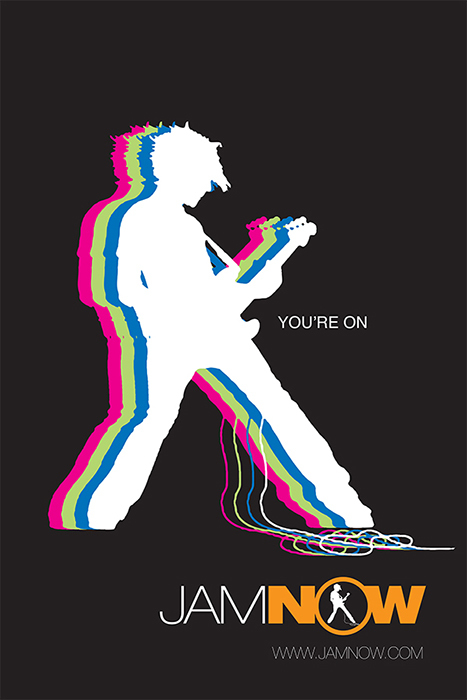 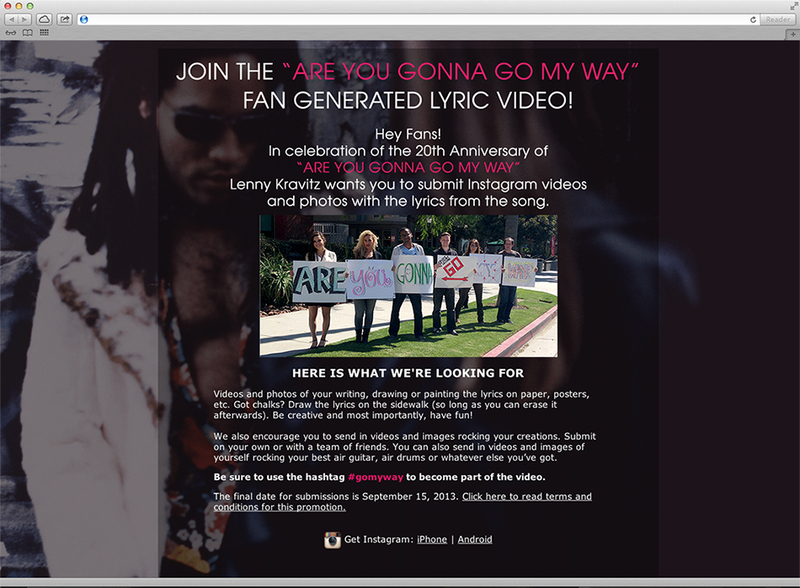 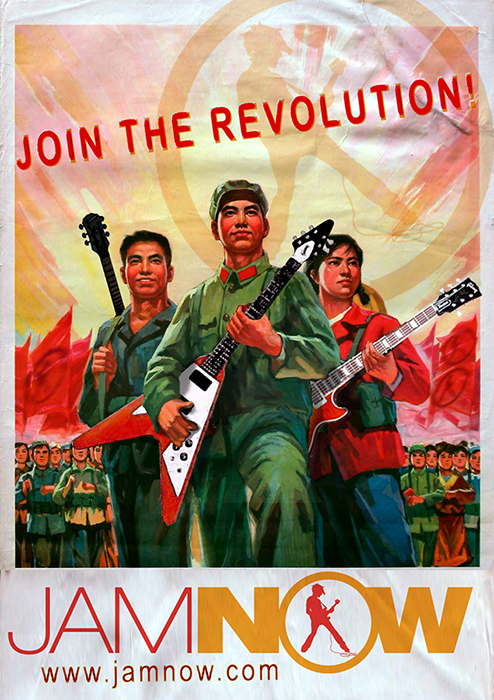 Viral marketing campaign launched to celebrate the 10th anniversary of Lenny Kravitz's Are You Going My Way album. 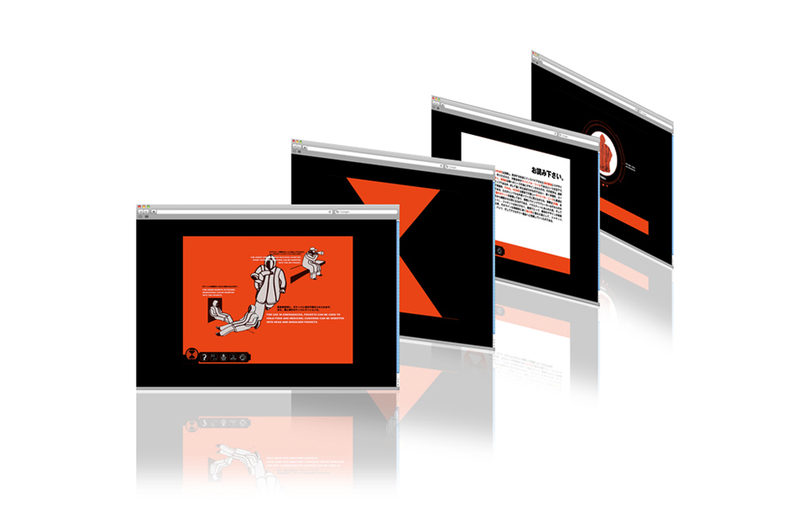 The program engages fans by letting them upload user generated content to social media sites, the content is then vetted and compiled into a video. 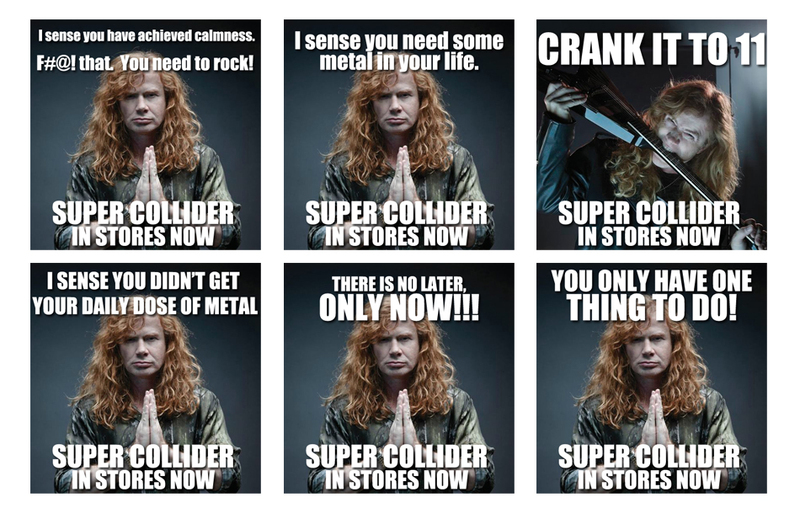 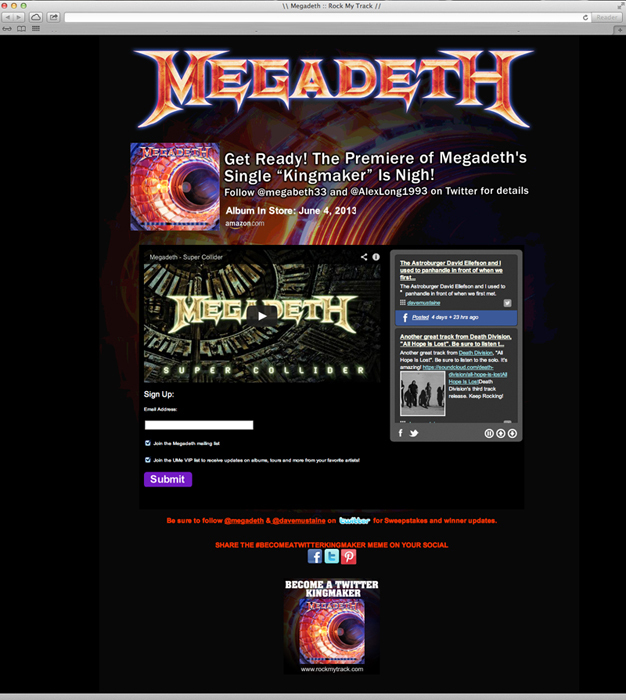 The launch campaign for Megadeth's new album included a unique social media contest where fans can host the debut of a new single through their twitter, turning the winner into an instant twitter giant overnight. 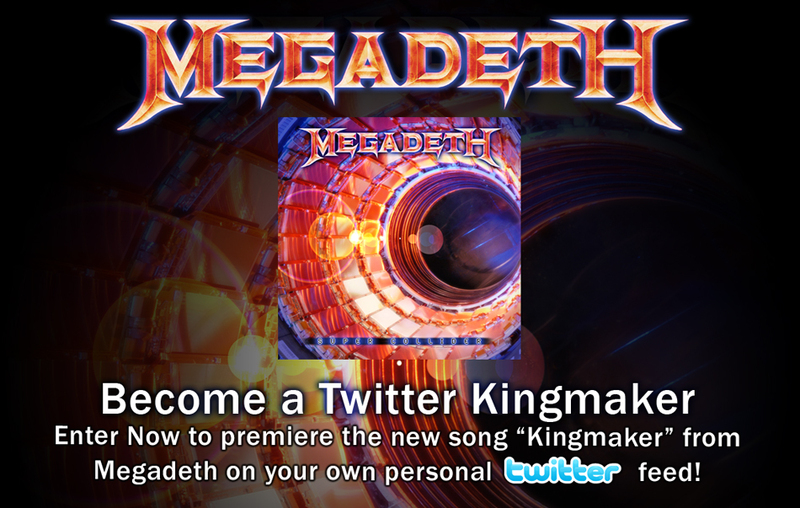 The initial promotion was so successful it lead to a series of additional "kingmaker" twitter promotions. 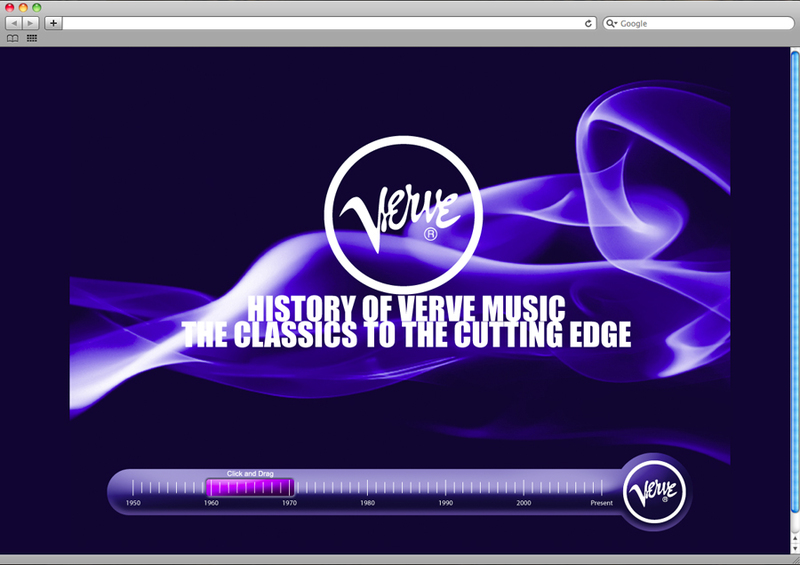 This flash micro site was designed to commemorate Verve Music's long history of Jazz music. 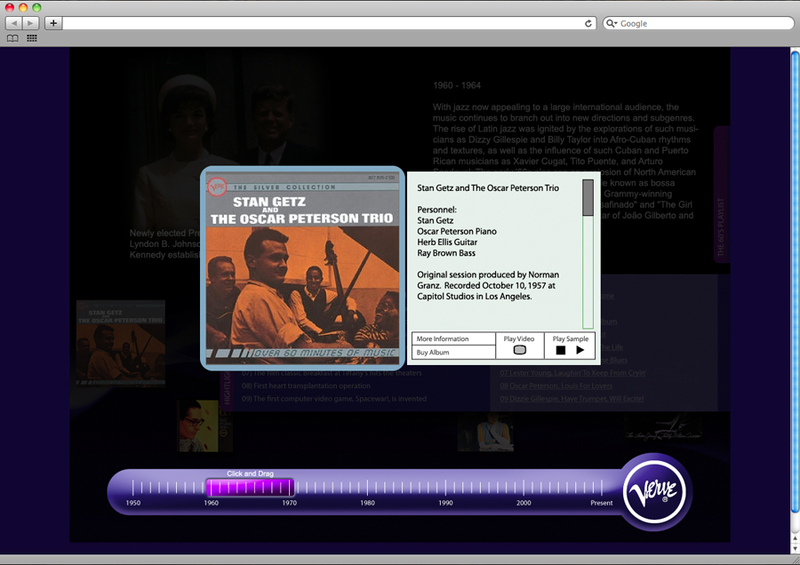 The timeline is broken up into decades with key historical events paired up with Verve releases during that time period, providing some historical context to the sounds and changes in Jazz music. 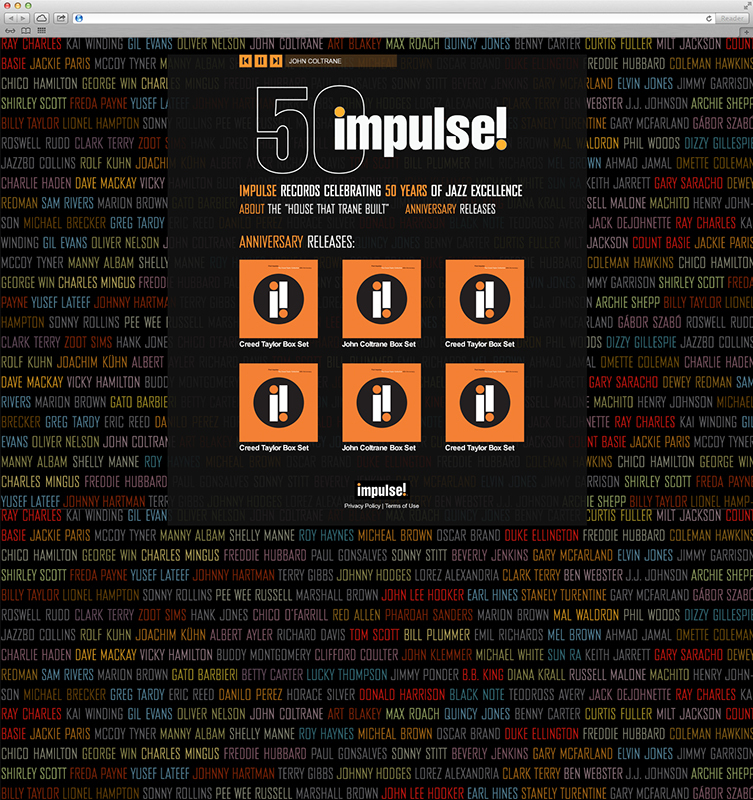 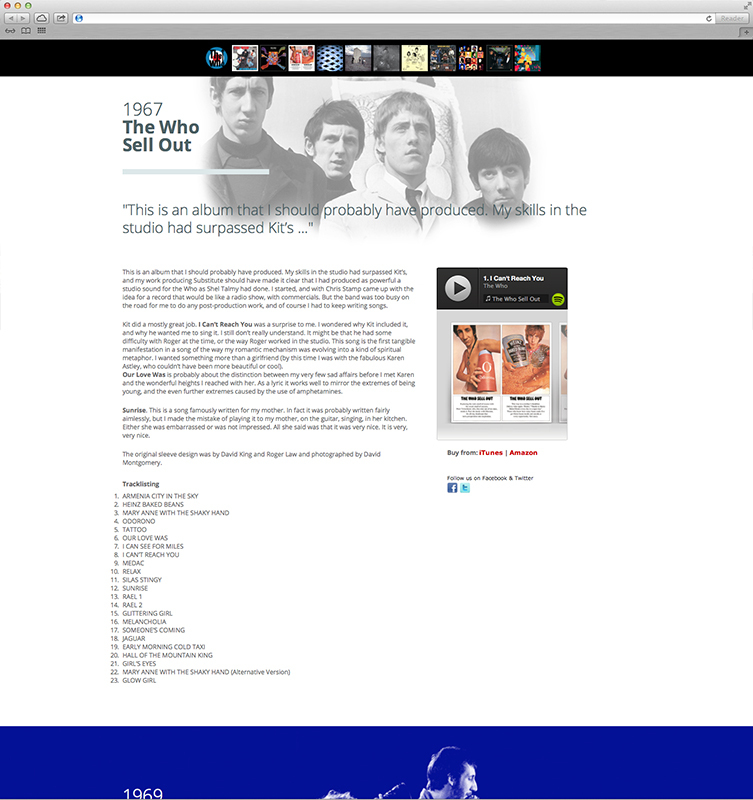 Impulse 50 promotional website, celebrating the 50th Anniversary of Impluse Records. 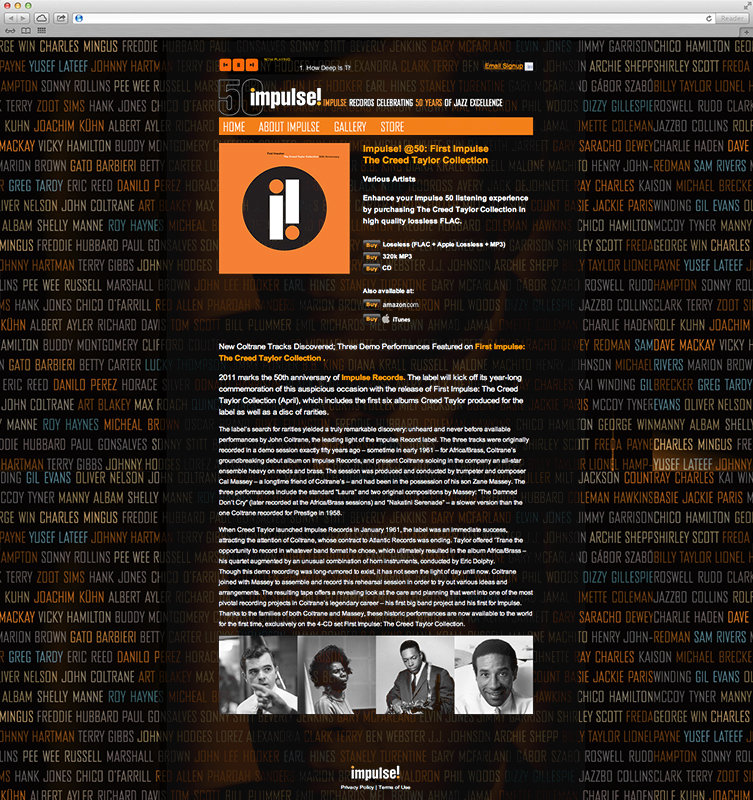 Impulse Records was the brainchild of legendary producer Creed Taylor. 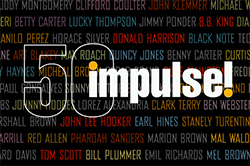 Fifty years after its birth, Impulse Records is being celebrated with the release of First Impulse: The Creed Taylor Collection, an exciting 4-disc collection that includes all of the timeless music produced by Taylor for the label that proudly wore its signature colors of orange and black on its spines. 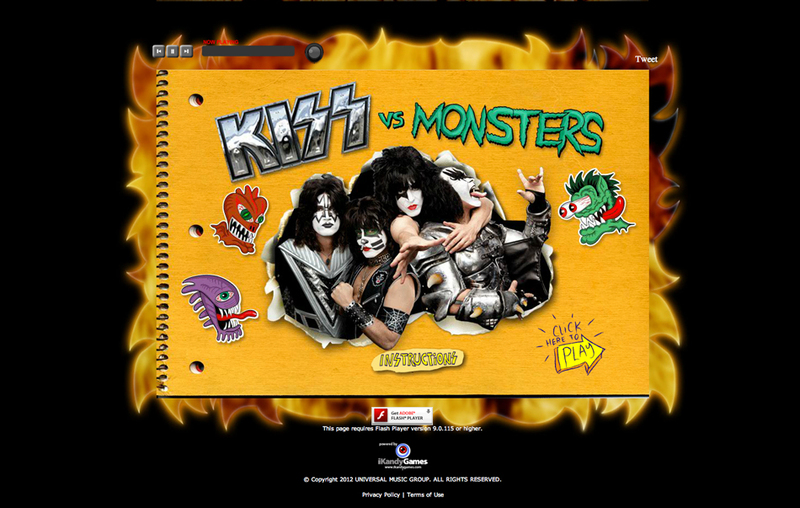 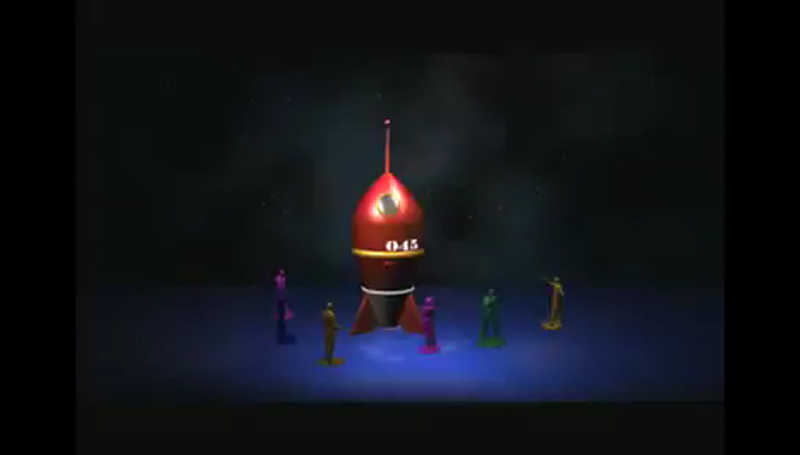 The KISS Monster campaign consisted of multiple viral marketing components that drove awareness and pre-release sales in the months leading up to the album launch. 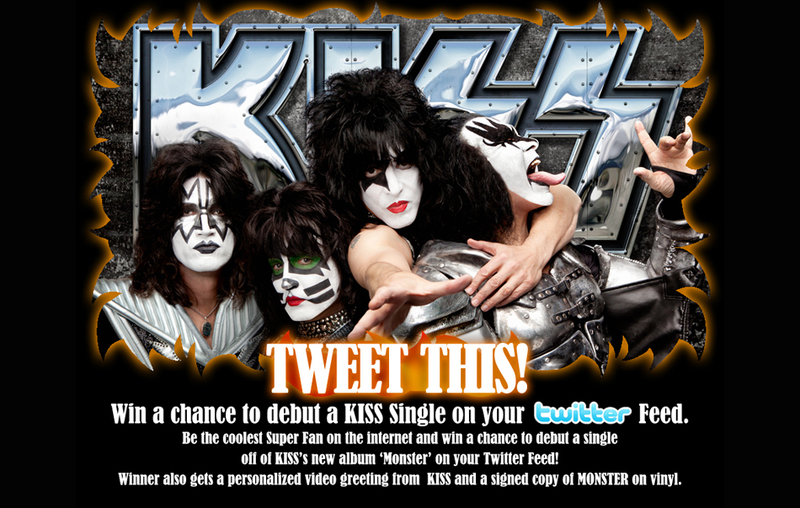 Virals included a twitter campaign that incentivized fans to "tweet" announcements about the new album, in doing so they qualified for the opportunity to win tickets and other prizes. 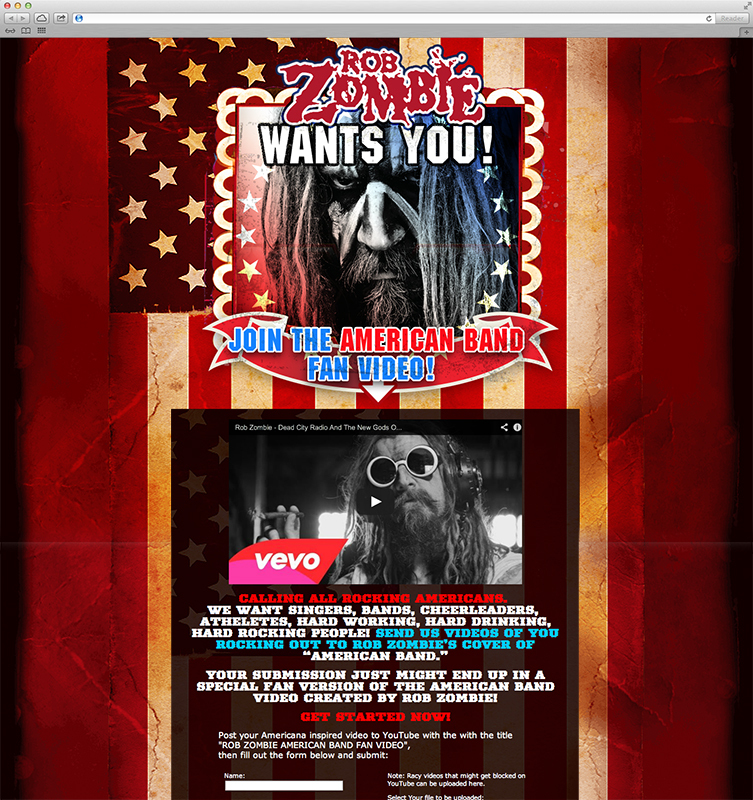 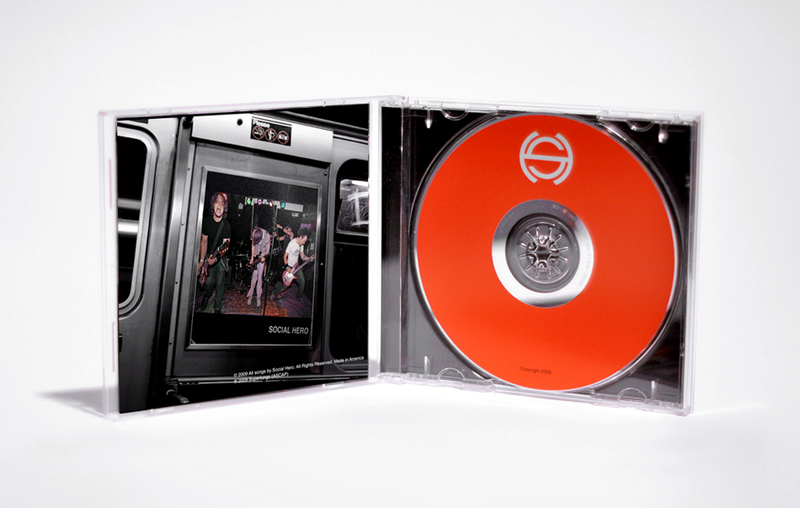 Other components included pre-order sweepstakes and a stand-alone flash game that served as a platform to debut the band's new singles. 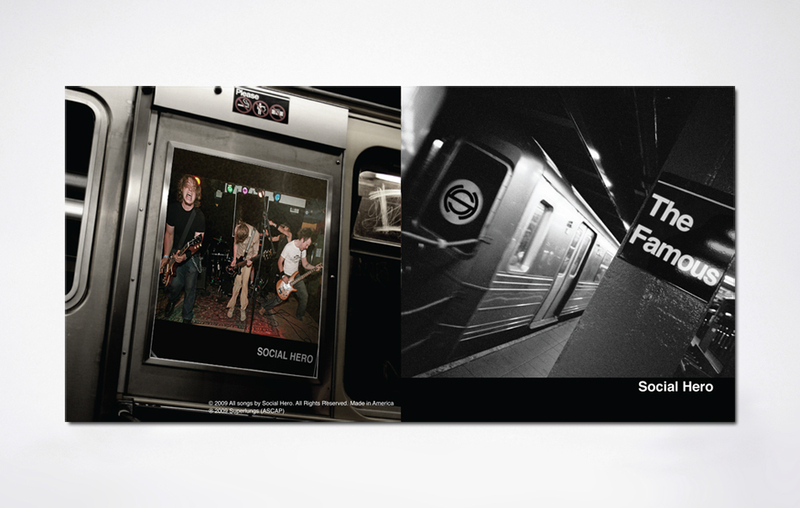 Package and merchandise design for the New York band Social Hero. 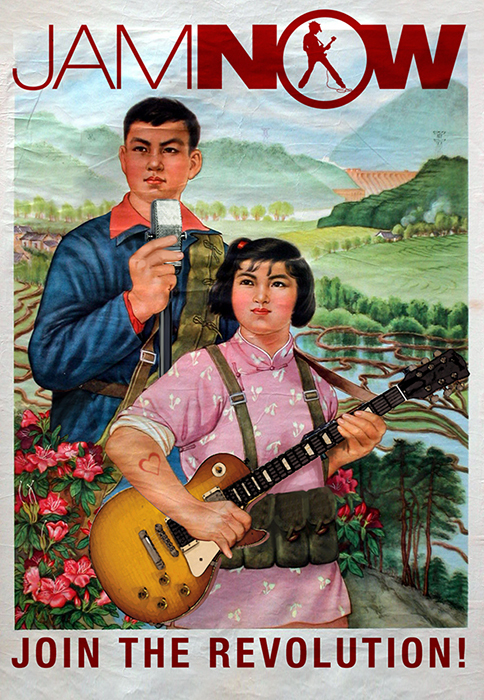 Social Hero (est. 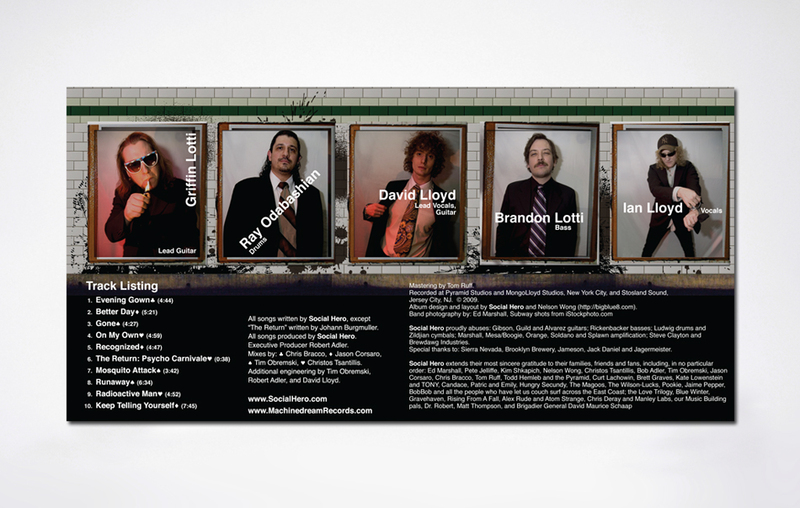 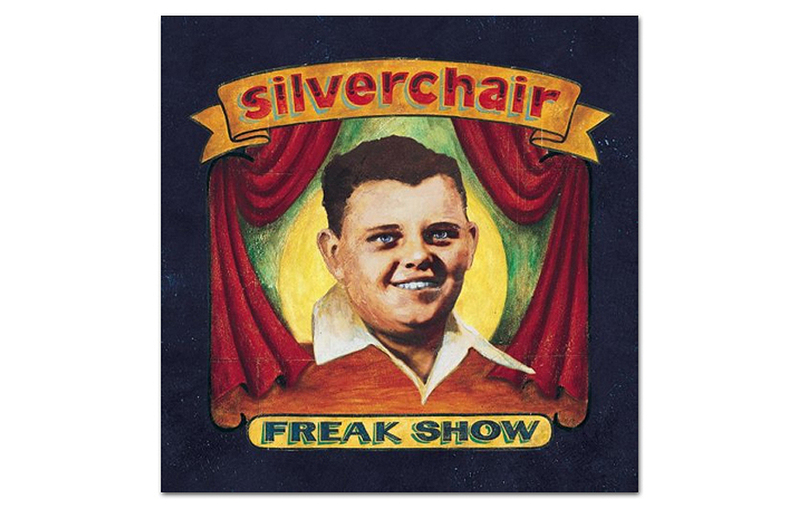 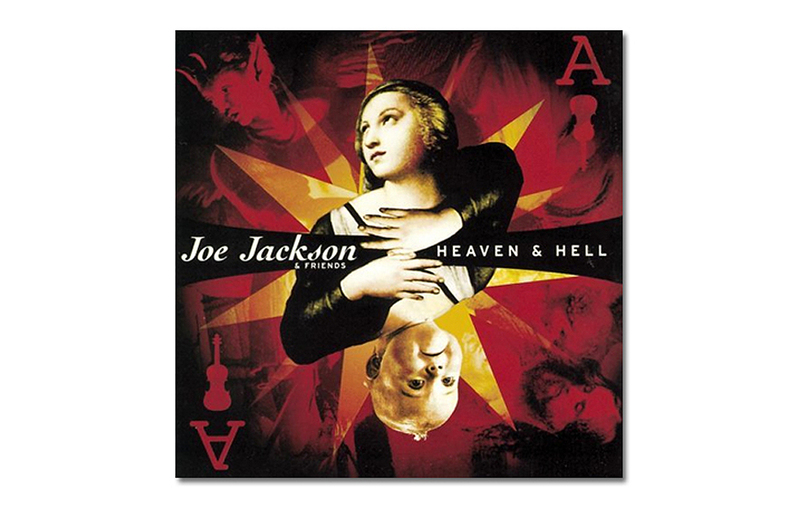 1998), a five-piece rock act from New York City, heralds a Renaissance of Rock and Roll. 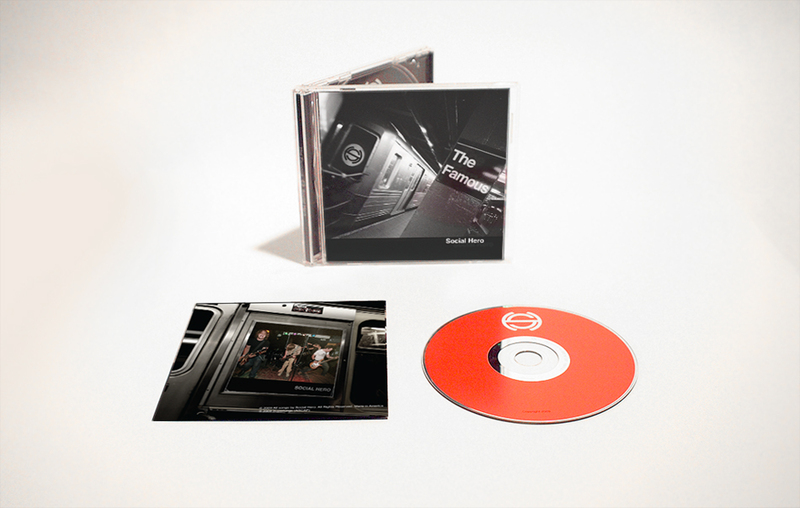 The story of Social Hero begins with their catalogue of tightly crafted original music, which showcases “a taste for power-pop hooks, crunchy guitars and arty embellishments” (Time Out New York). 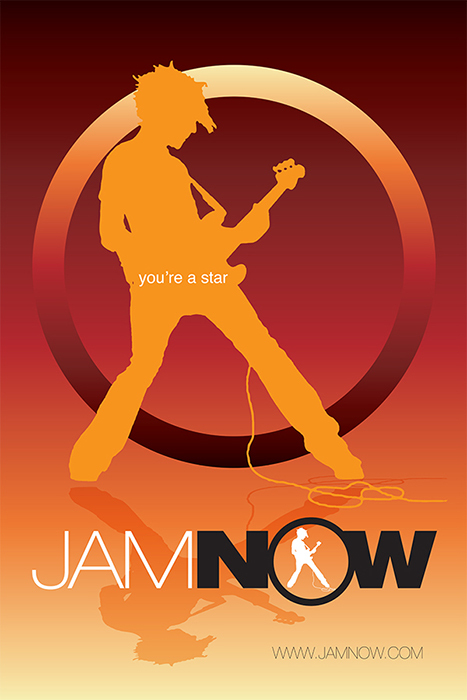 These are large scale poster designs for internet start-up JAMNOW. 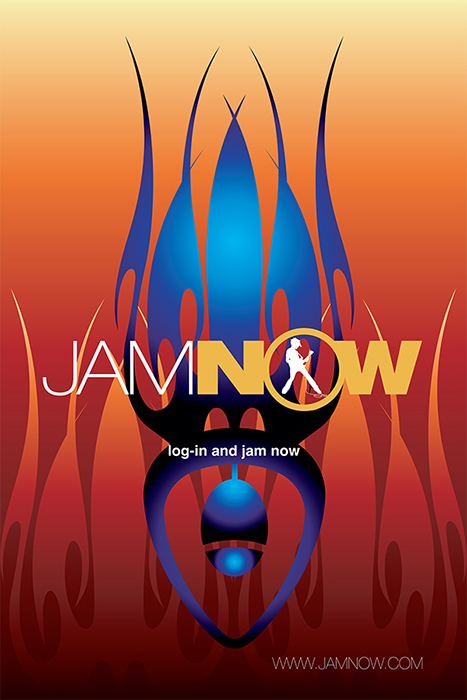 A collaborative network that allowed musicians to perform with each other over standard broadband connect with little latency and high quality audio. 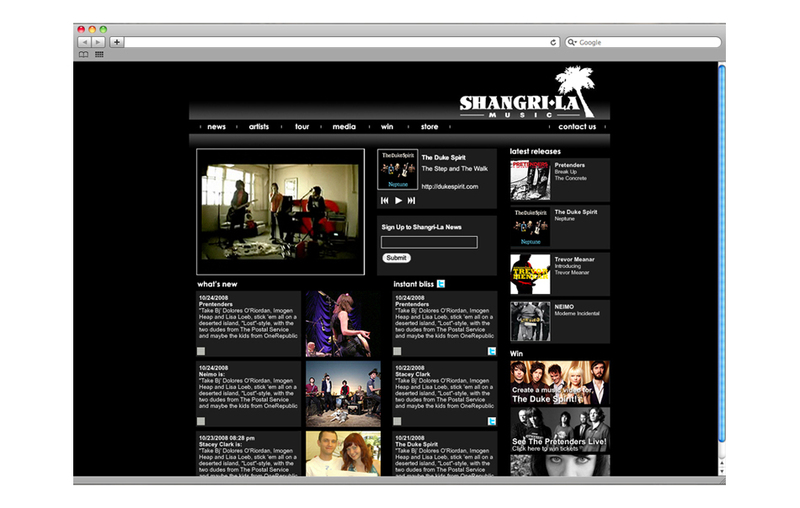 Shangri-La Music is an indie record label based in Santa Monica, California. 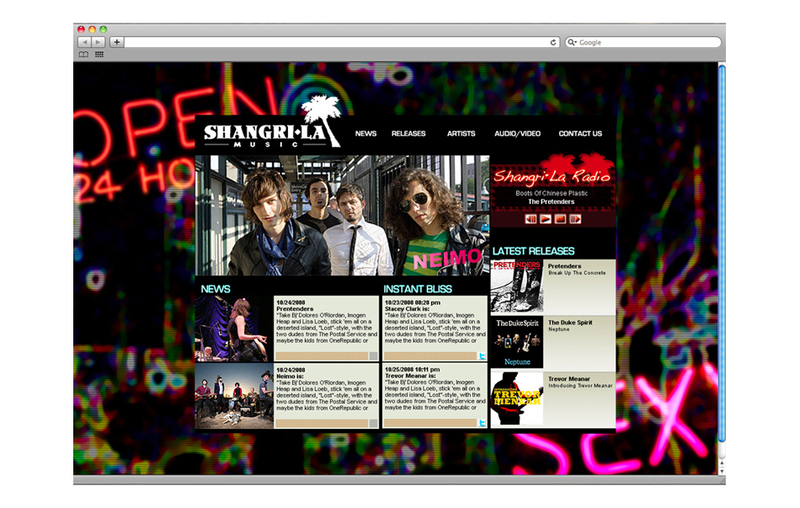 The label was started by Steve Bing as an expansion of Shangri-La Entertainment. 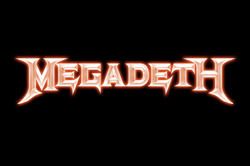 Co-founders Jeff Ayeroff and Jon Rubin run the label. 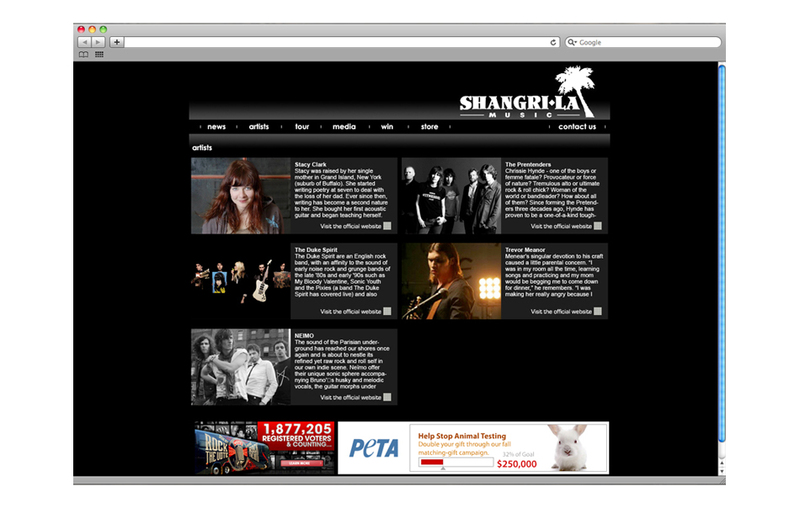 Shangri-La Music is a "boutique" label, which is a smaller, more specialized label and offers 360 deals. 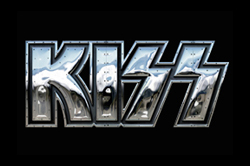 360 deals allow the label to share in bands' touring and merchandise profits as well as digital branding rights instead of profiting off of music sales alone. 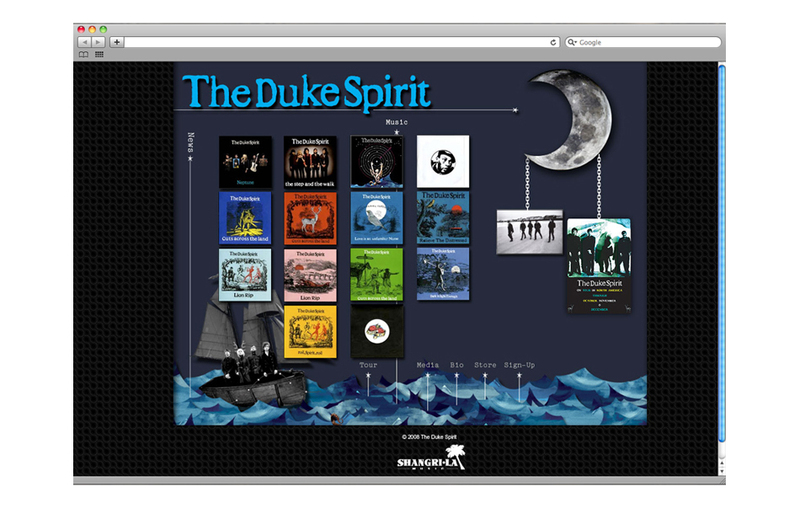 U.K. band The Duke Spirit is comprised of friends who met in art school. 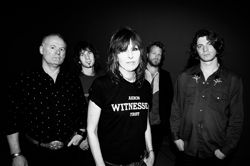 Their sound has been seen as a melding of many influences ranging from the alternative noise of 1980s/90s guitar bands such as My Bloody Valentine, Sonic Youth and Spacemen 3, the tremulous rock n roll of bands such as The Gun Club and The Cramps, early R&B, garage and psychedelia, through to a distinctive rhythmic ‘Atlantic soul’ and Motown influence. 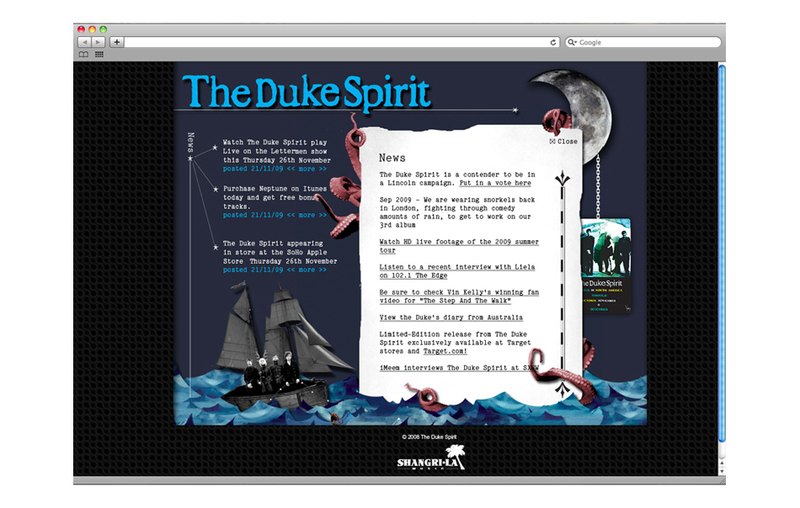 The Duke Spirit has worked with the likes of James Lavell (Unkle) and the lead singer Liela Moss has become a fashion icon, collaborating with designers like Alexander McQueen. 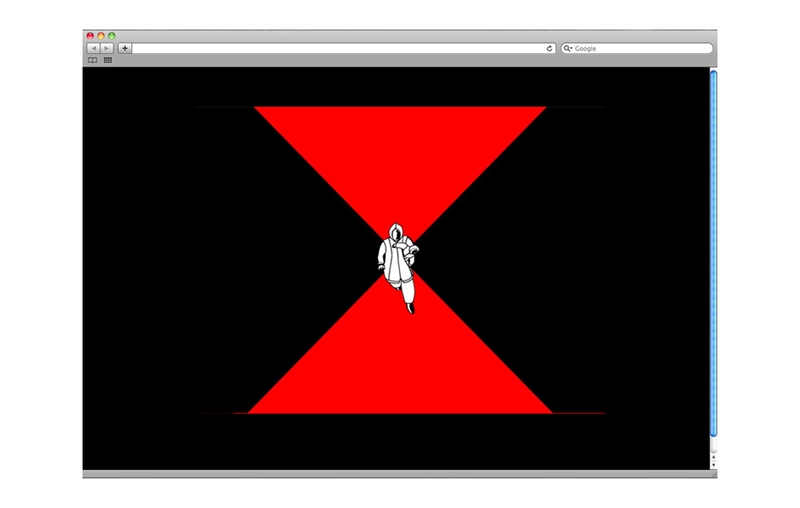 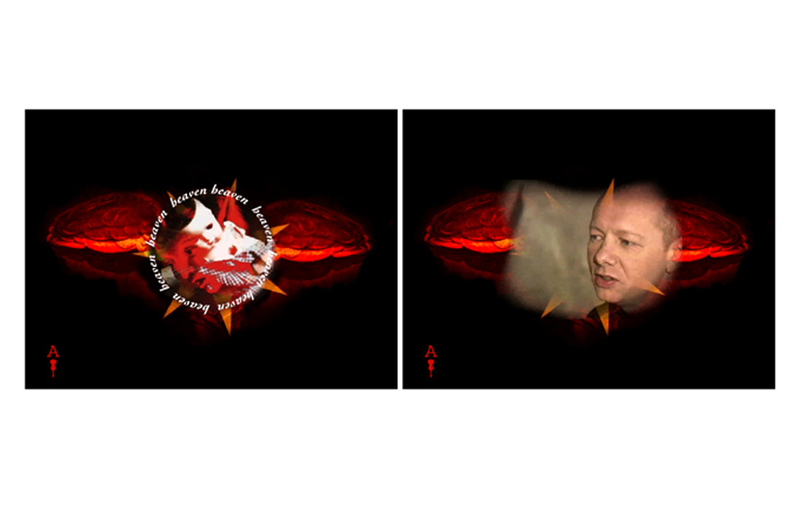 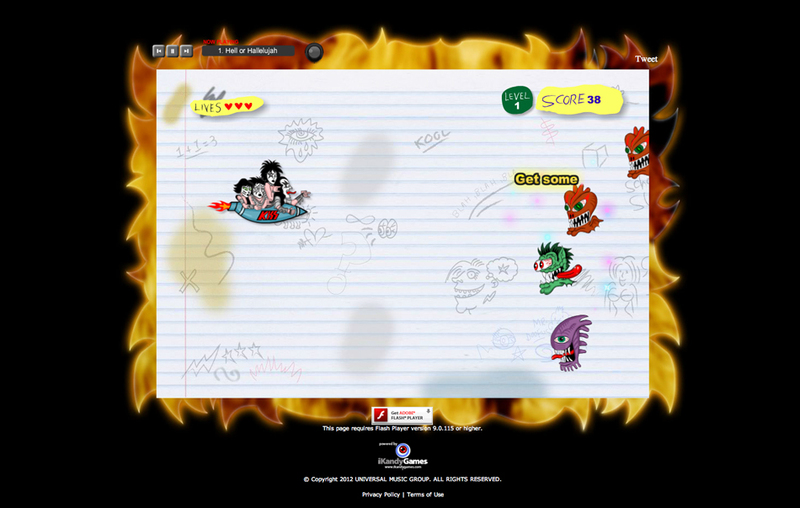 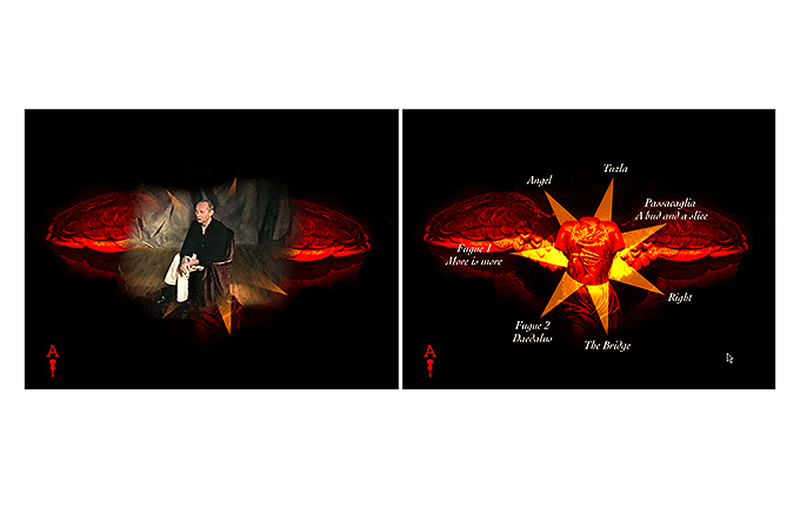 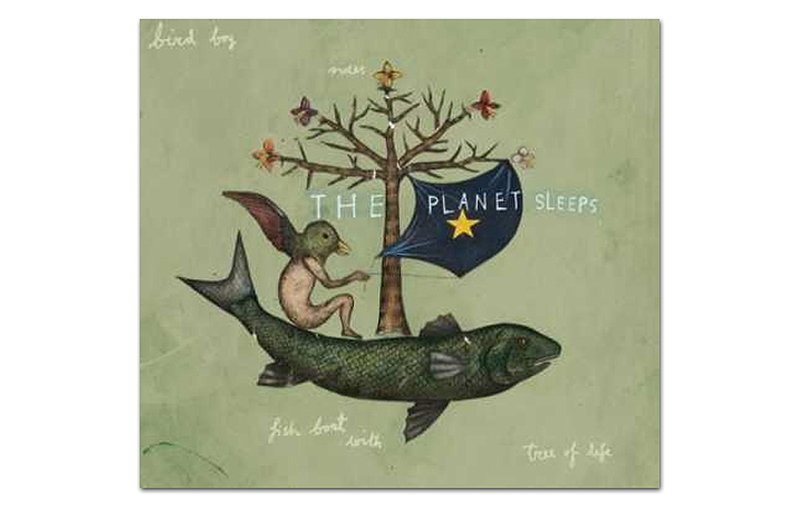 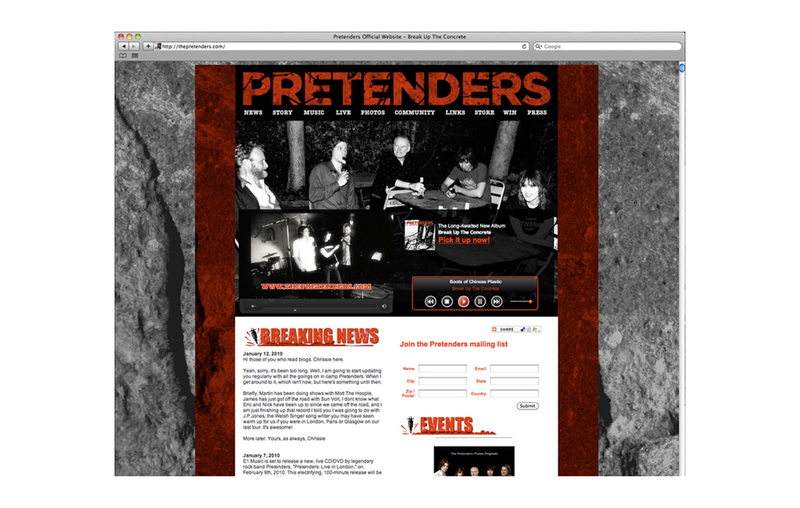 With so much creativity in one place, the band had a very clear vision of creating a art piece for their website. 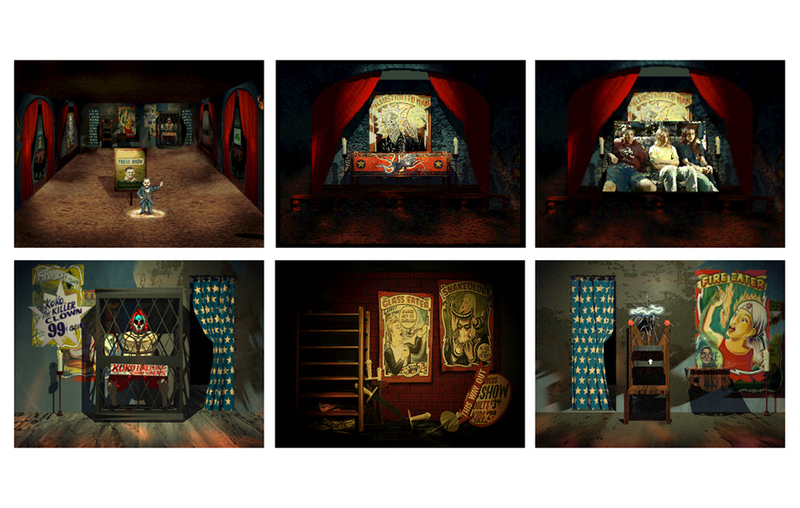 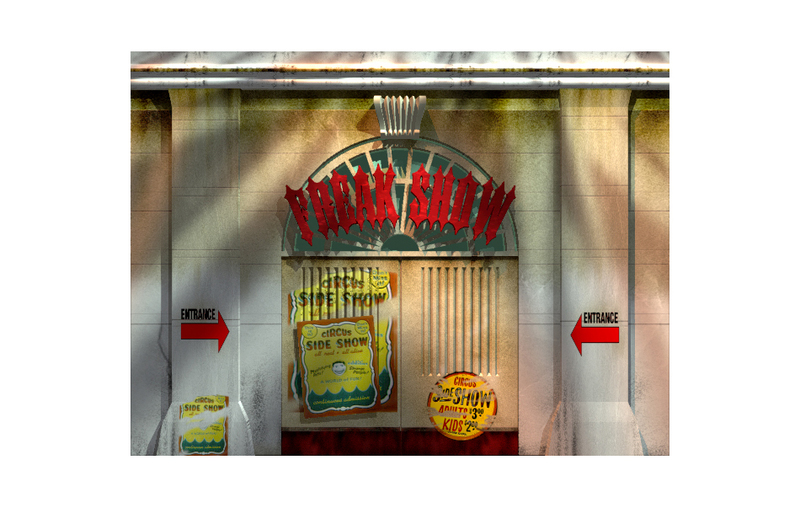 The site is reminiscent of vintage cut paper puppet theatre, with lots of subtle animated elements. 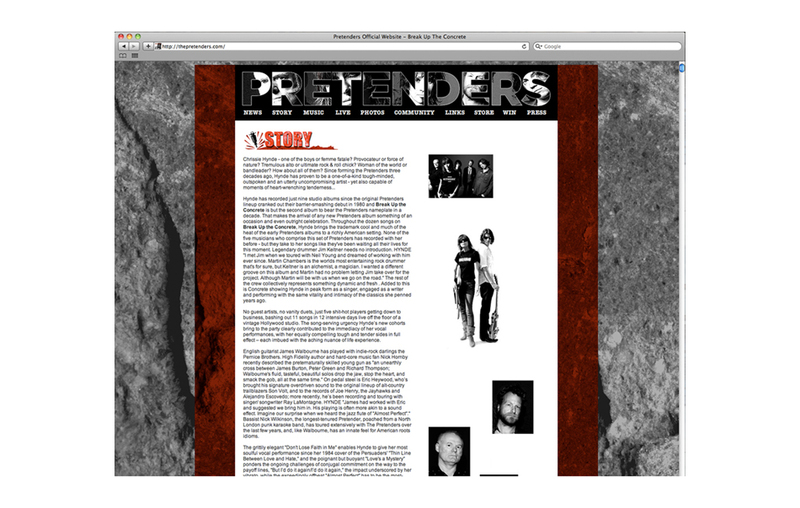 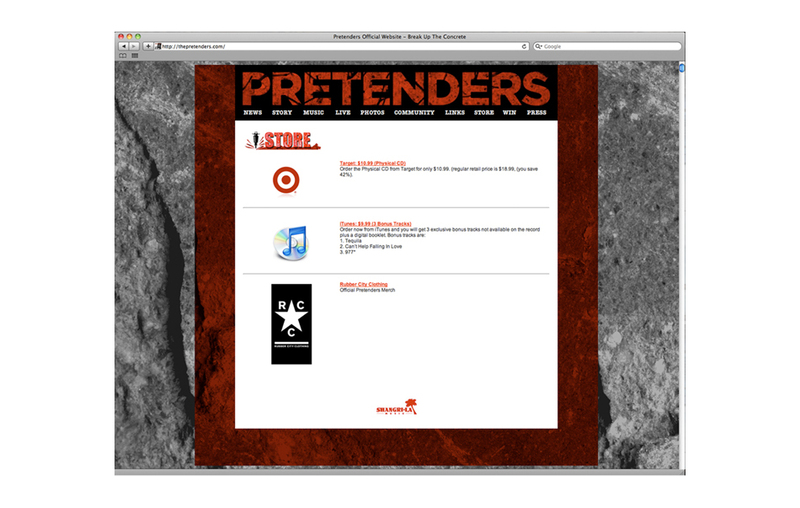 Legendary band The Pretenders never had a online presence before, this simple wordpress site was designed to promote their new album "Break Uup The Concrete" and serve as a platform for their charitable causes. 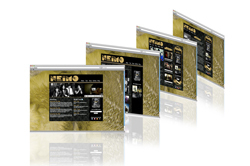 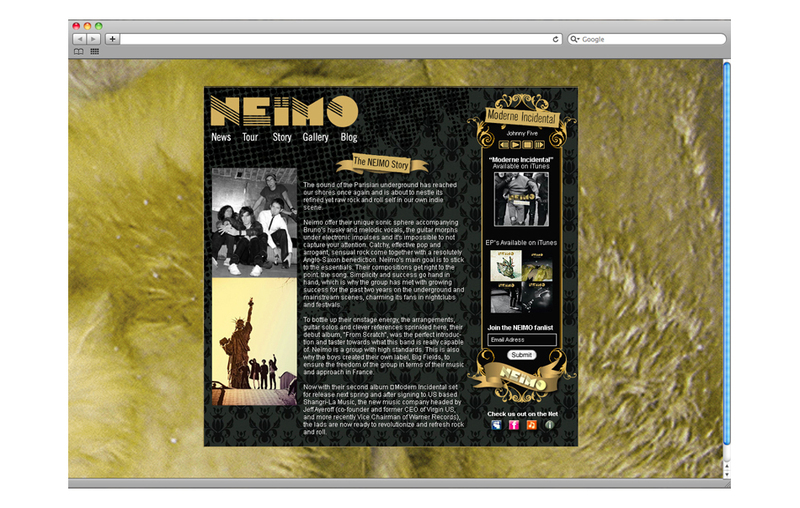 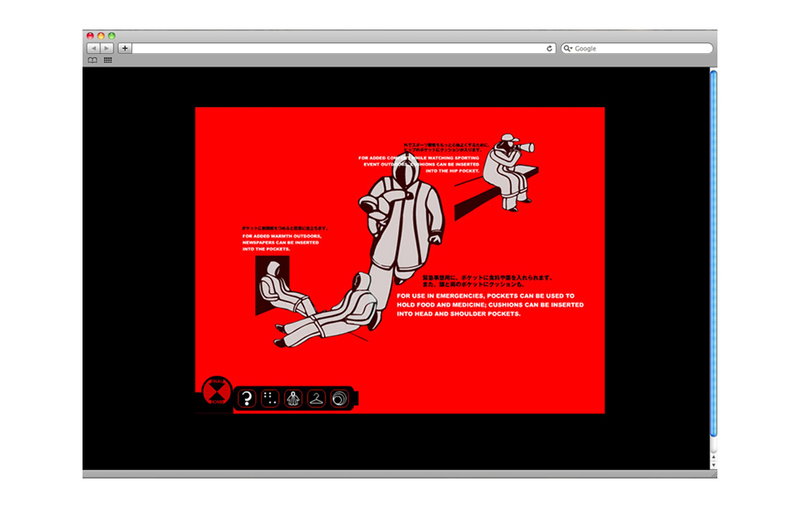 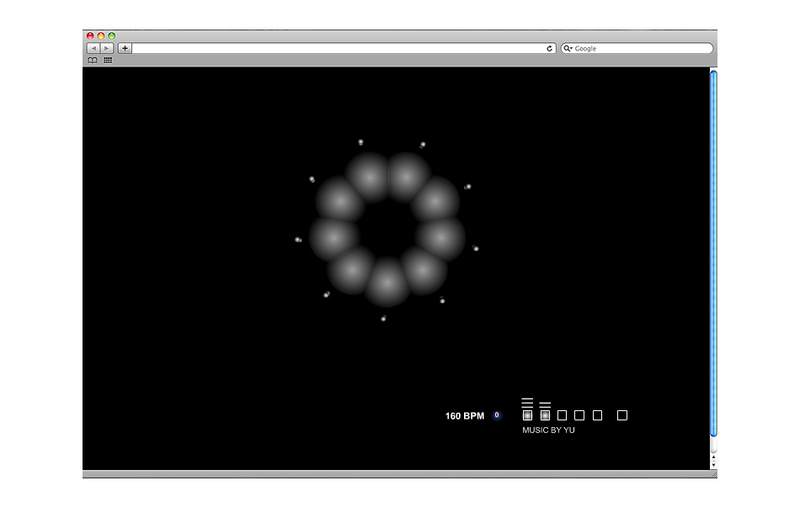 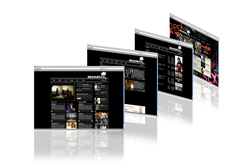 Music website designed for the french rock band Neimo. 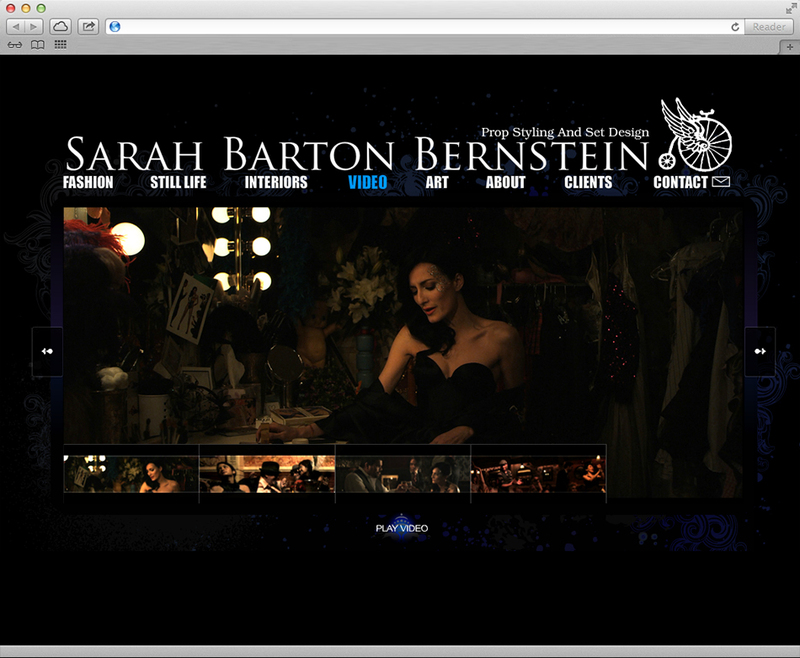 The theme is evocative of vintage french decadence with a bit of rock-n-roll tossed in. 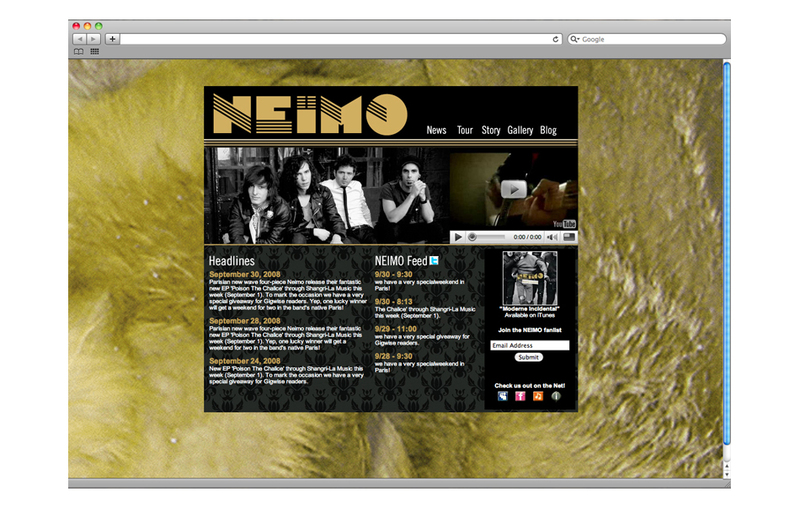 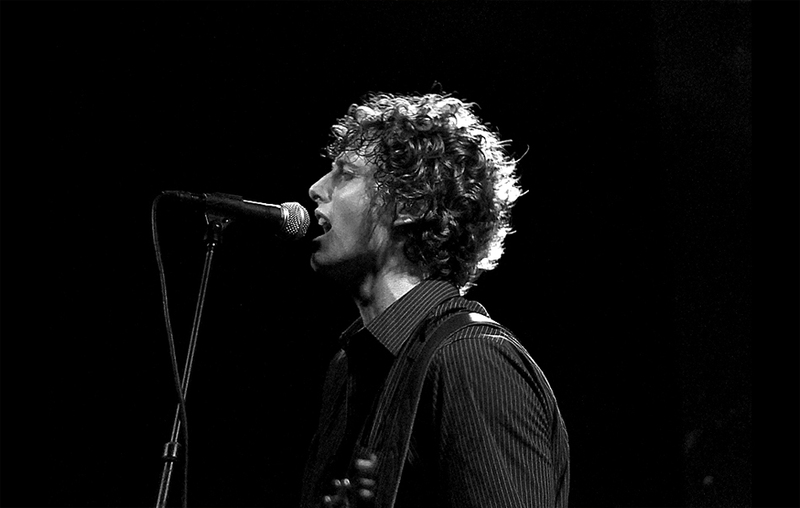 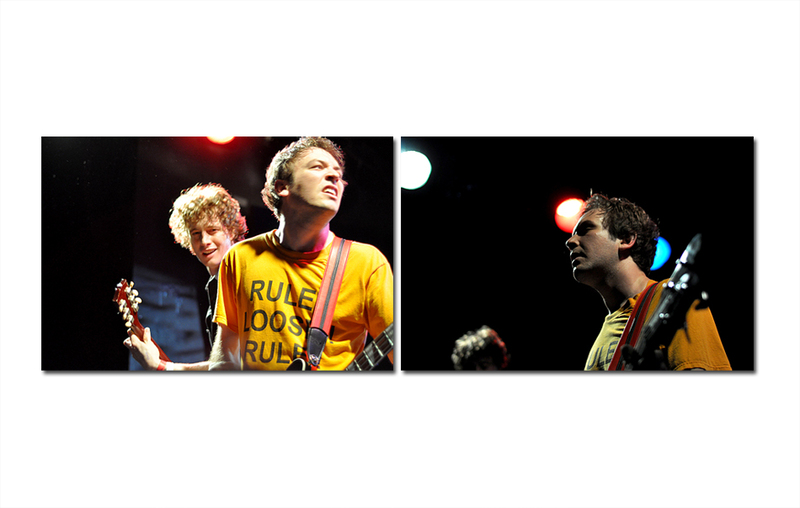 Neimo is an indie rock band from France. 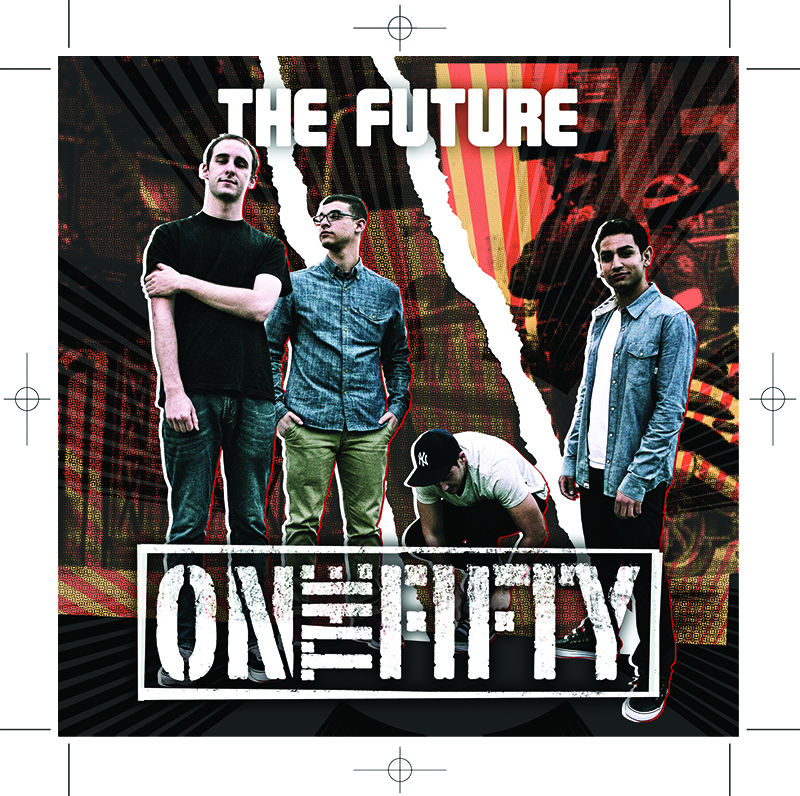 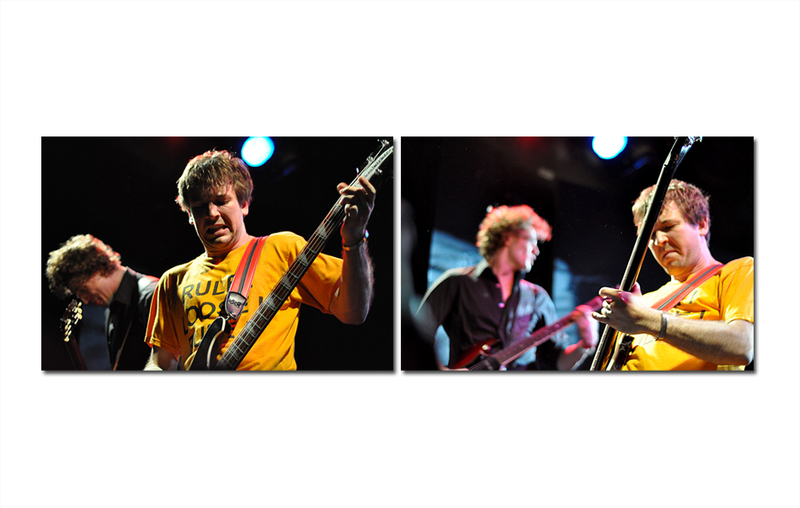 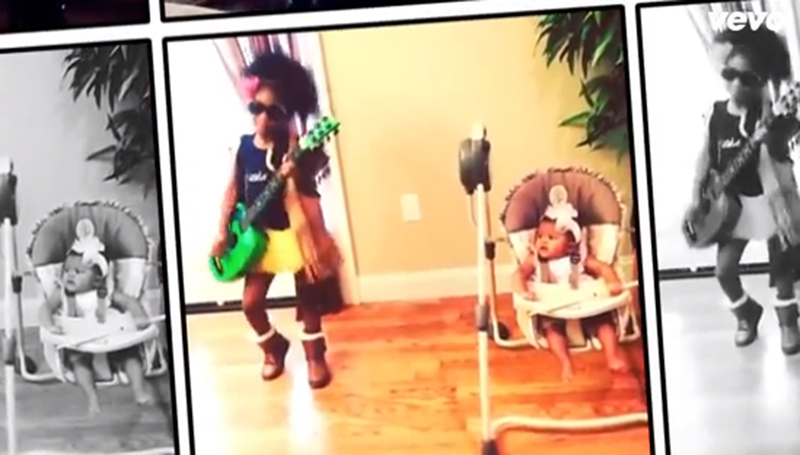 The band pairs guitar with electronic elements to create a Euro-rock and 1980s sound. 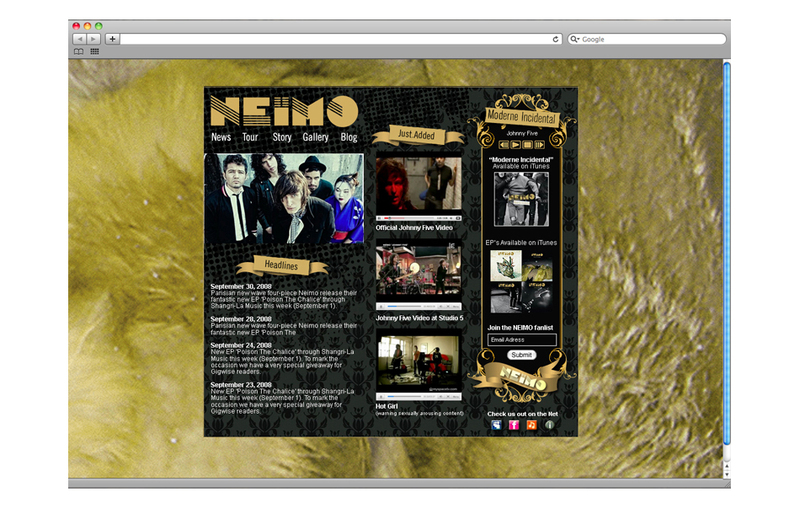 Neimo is influenced by David Bowie, Blondie, Emilie Simon, New Order, Velvet Underground and the Stooges. 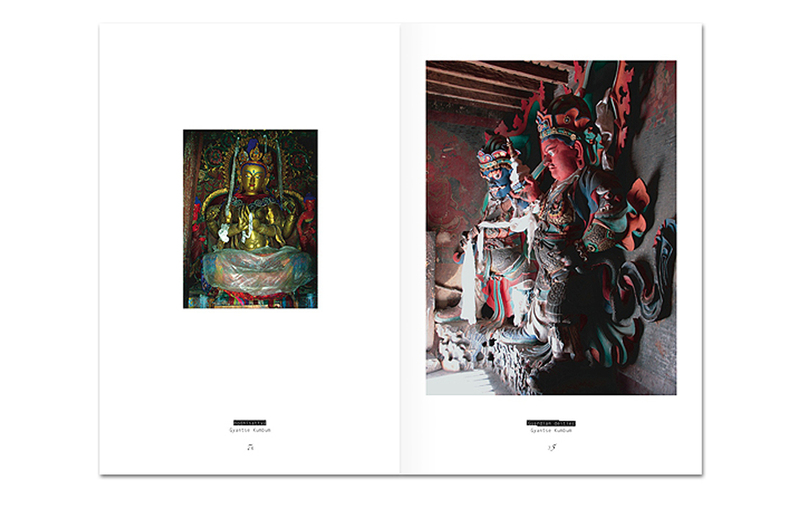 Observations From Snowland is a snapshot of an endangered culture. 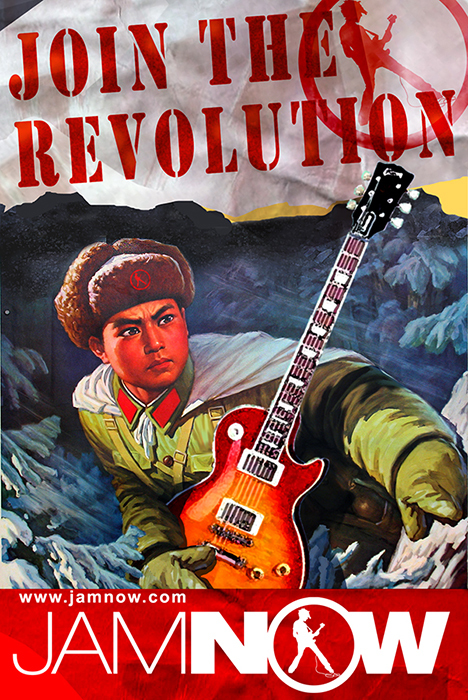 Tibet the mythic country on top of the world, affectionately called Snowland, teeters between ancient traditions and the 21st century. 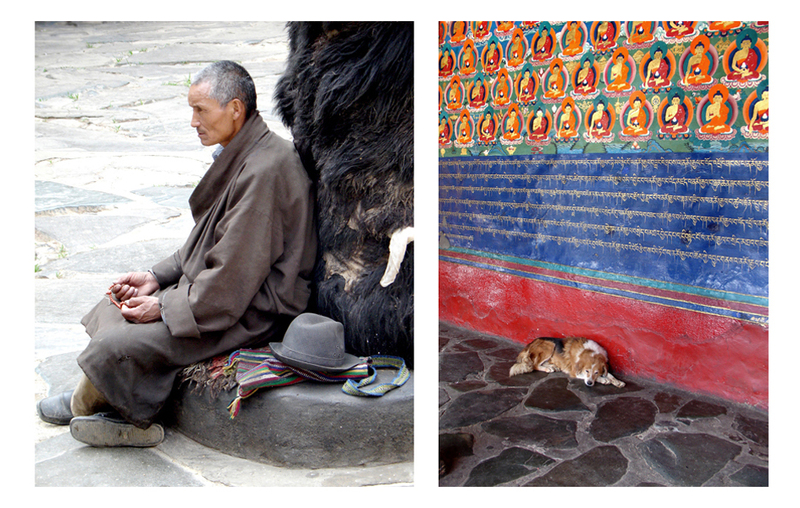 Peer inside this deeply spiritual land filled with temples, monasteries and pristine landscape. 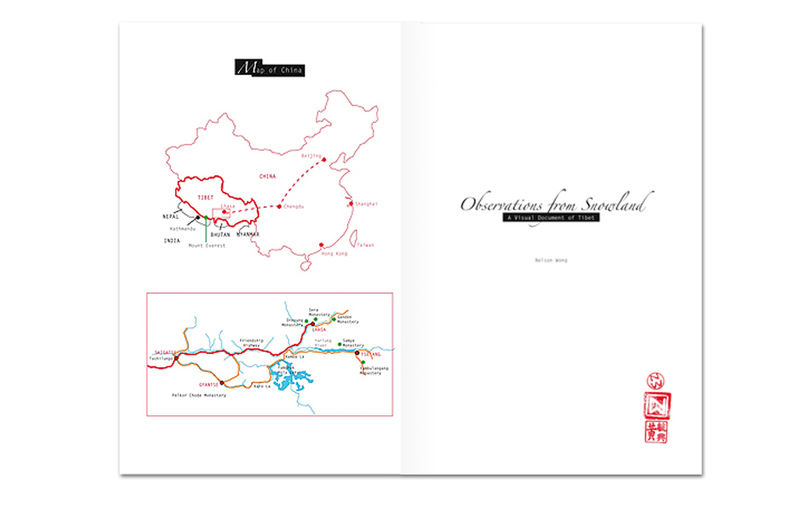 This self published book documents my travels through Tibet during the months before the opening of the Qinhai railway. 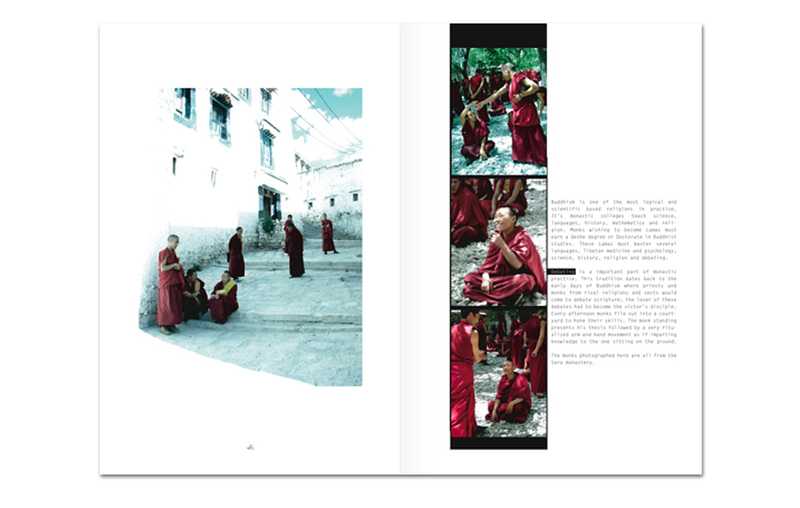 The book is compiled from photography and excerpts from my mobile travel blog. 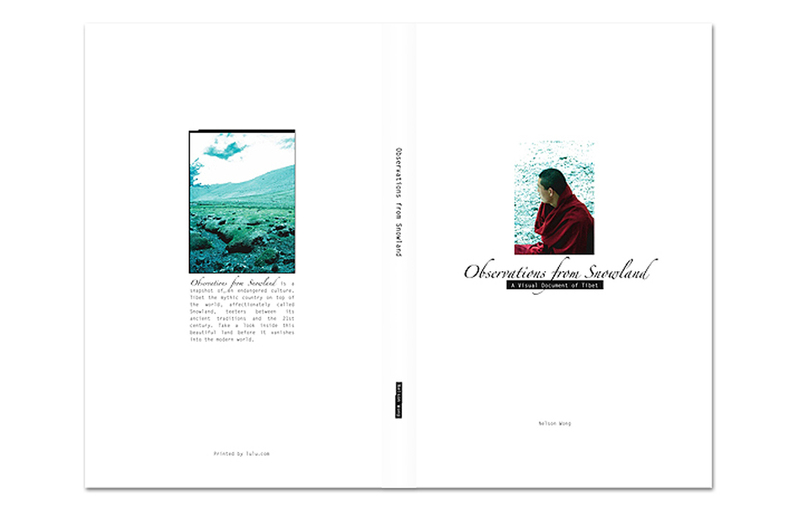 Observations From Snowland was also a experiment in on-demand publishing, researching alternative publishing/business models, revenue sharing and environmentally friendly/low impact print distribution. 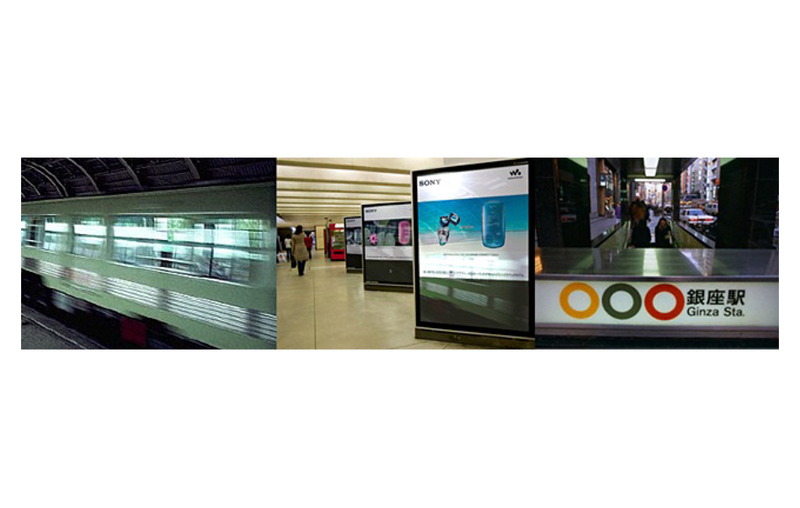 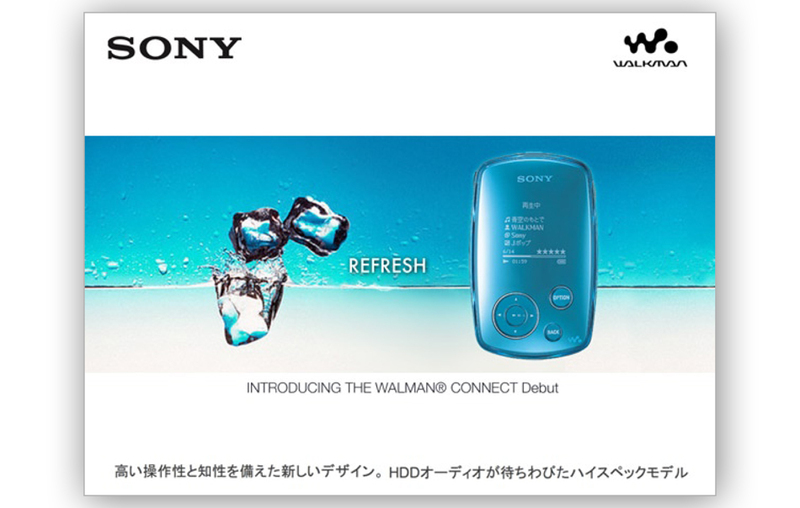 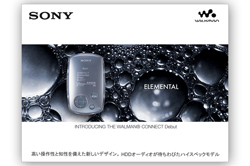 These ads were created to reintroduce the Walkman line of portable devices. 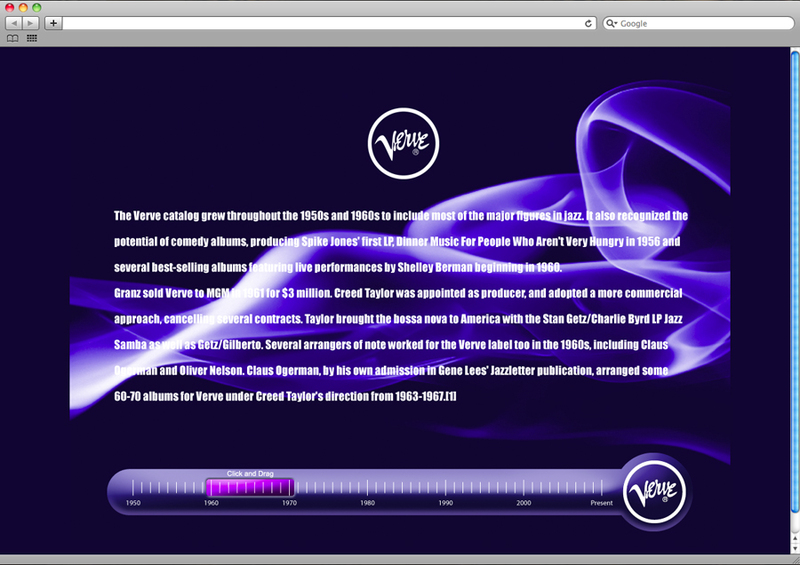 The brand has a long association with consumers as the device that changed the way we listen to music. 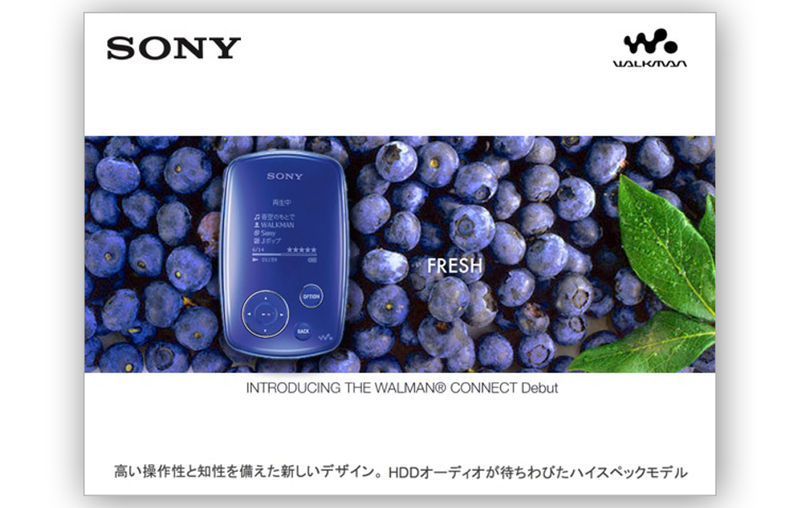 However in recent years with the rise of iPod the brand is more associated with years gone by. 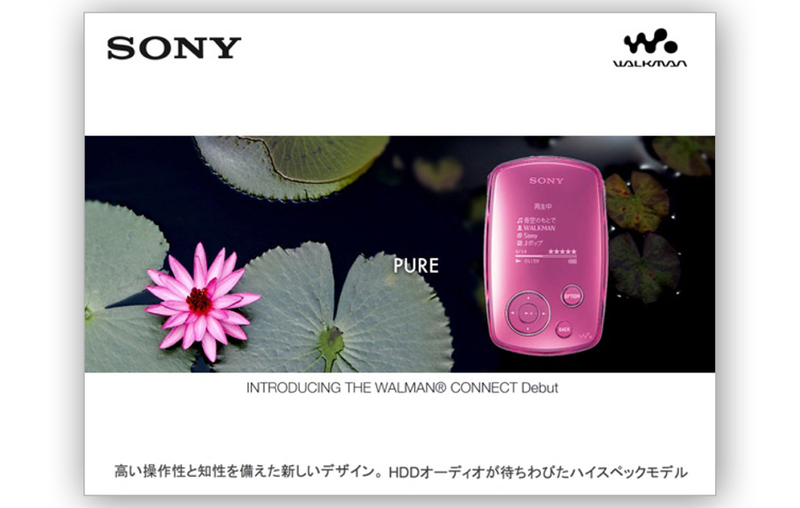 The new device designs were a shift in Sony design vocabulary, introducing new colors, forms and materials that have pleasing tactile qualities, interactivity, and are environmentally friendly. 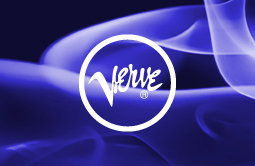 In order to reintroduce the brand to a younger audience (without alienating existing customers) these ads shift focus away from fighting a features war and communicate more of the emotive qualities. 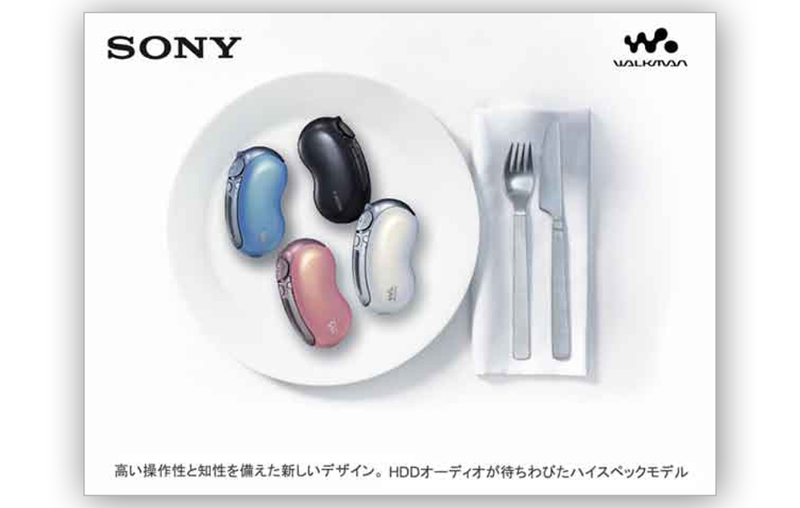 Pairing the devices with images that are evocative of this new vocabulary creates a dialog that moves the brand away from the “my parents” generation to a refresh of a great brand. 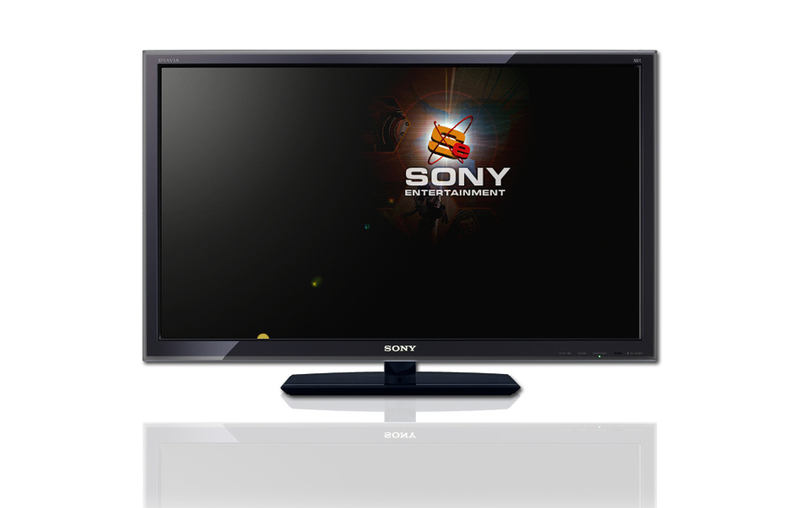 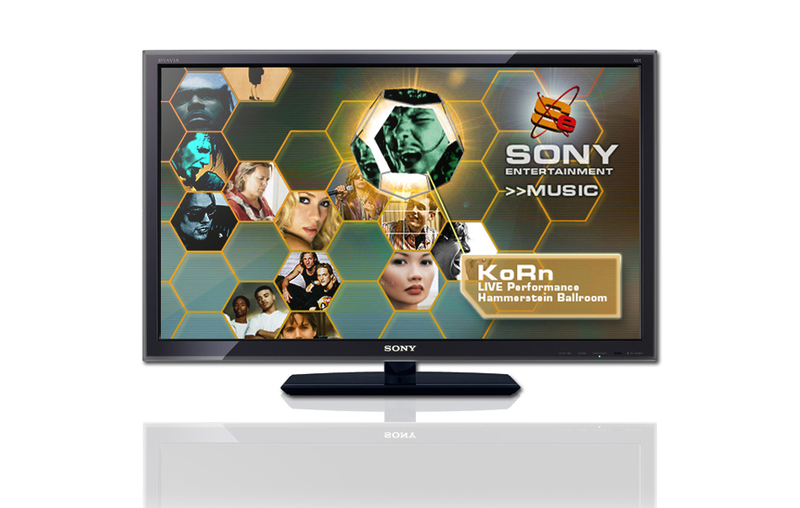 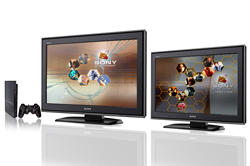 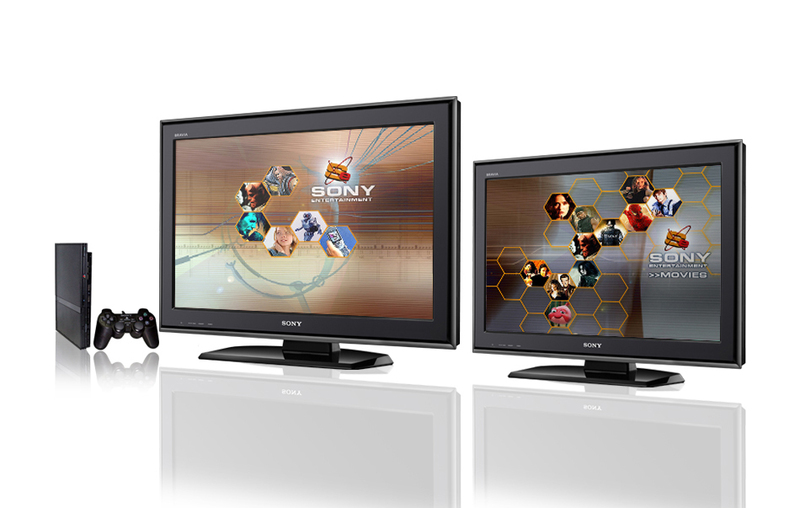 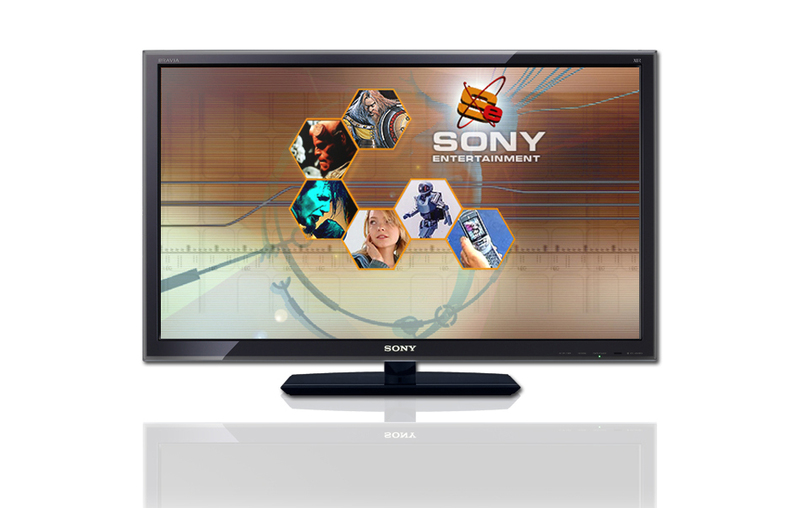 Sony Digital Entertainment Network formed to create a end to end hardware, software and services solution for Sony, a unique working group consisting of members from electronics, gaming, movies and music. 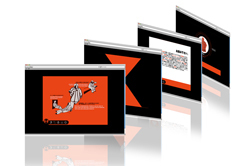 Tasked with creating a comprehensive program addressing the end to end user experience, requirements from the various business groups, service experiences, visual language and interfaces. 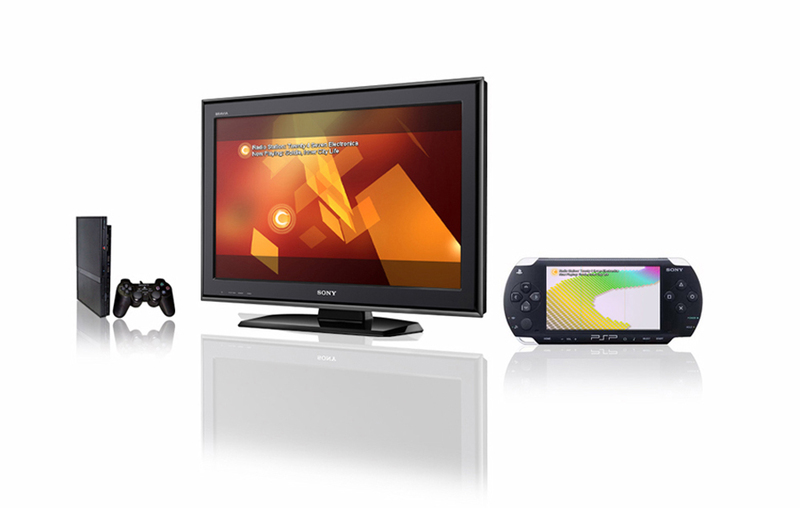 The program included addressing consistent interfaces across the various device platforms, from small screen portable devices to 10 feet UI’s, as well as mapping out consistent controller behaviors across hardware platforms. 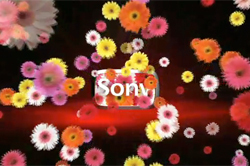 These short clips were designed as pre-roll movies that are played while heavy media is being buffered or downloaded in the background on Sony’s digital entertainment platforms. 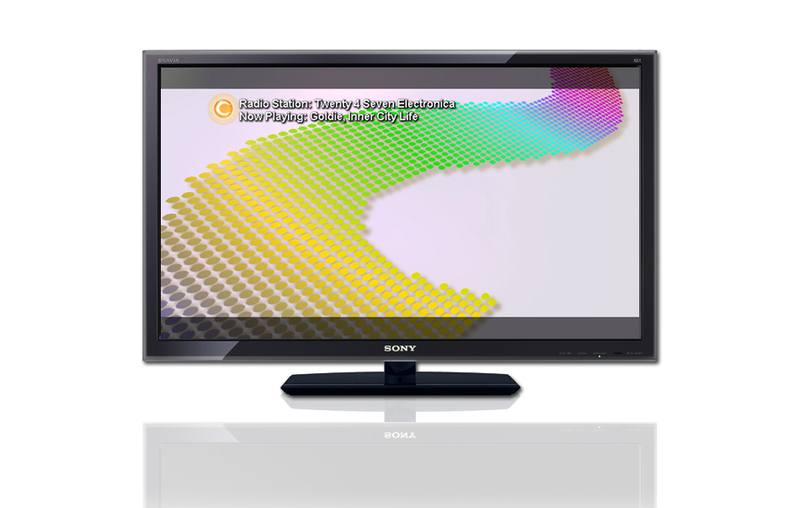 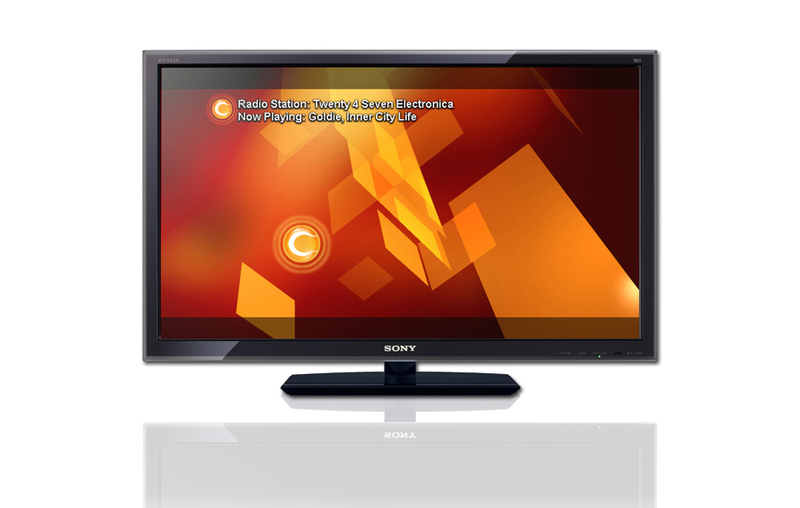 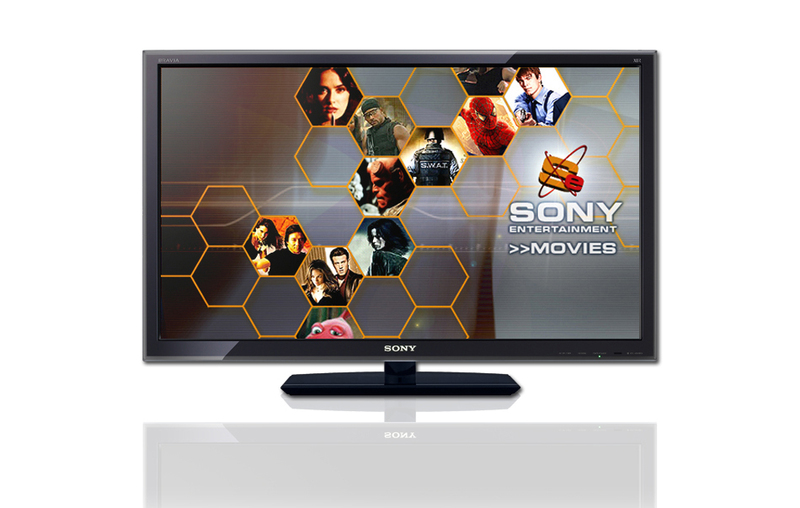 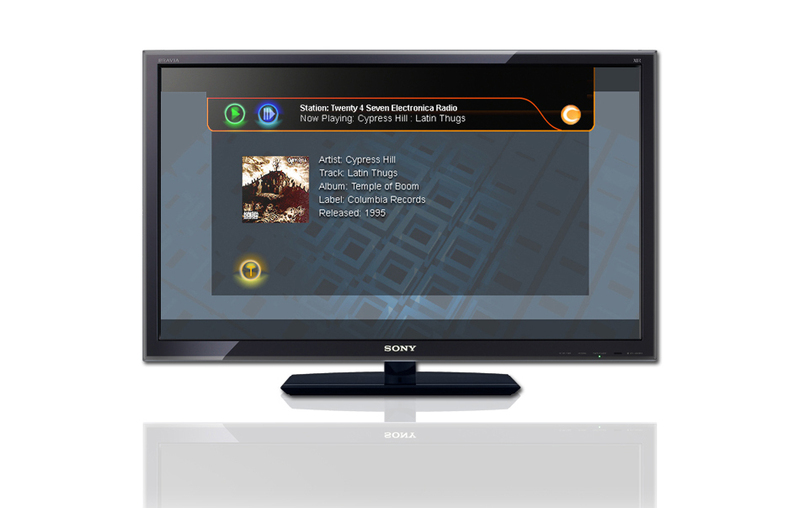 CDExtra or Enhanced CD is the multi-media component added to a normal audio CD. 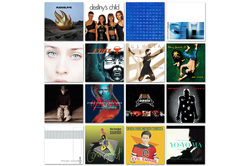 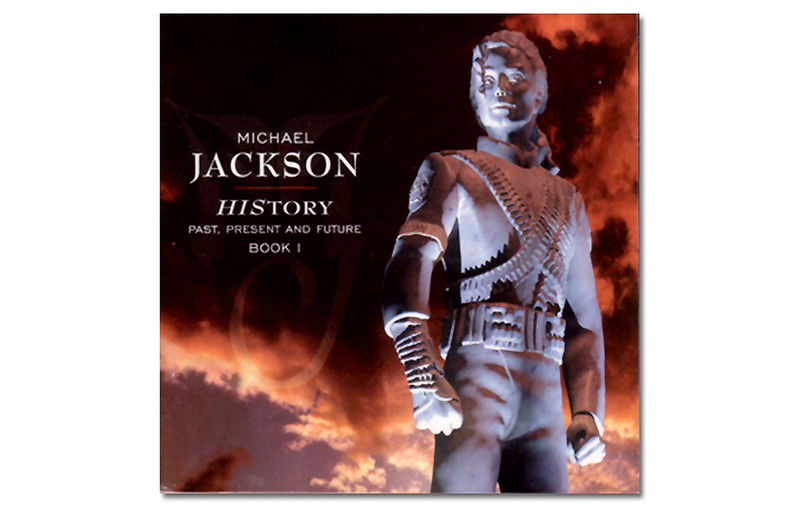 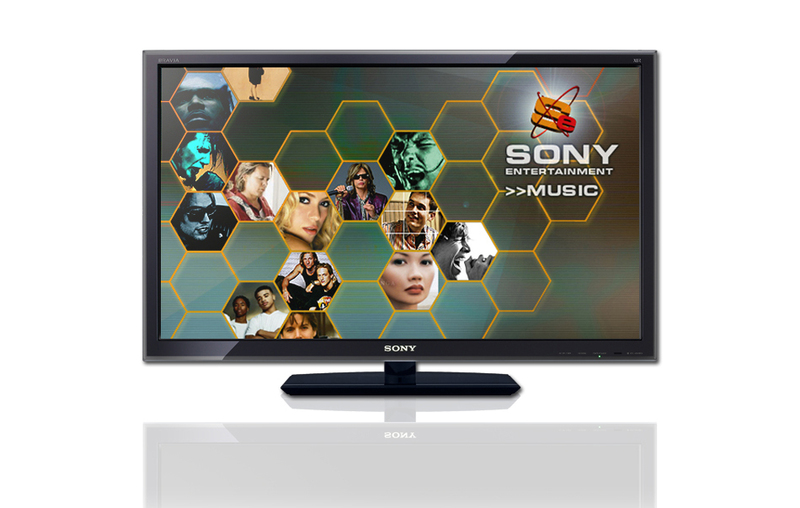 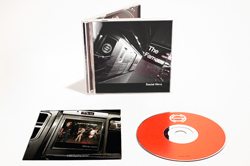 Sony Music pioneered the format back in the 90’s before the prevalence of digital music and file downloads. 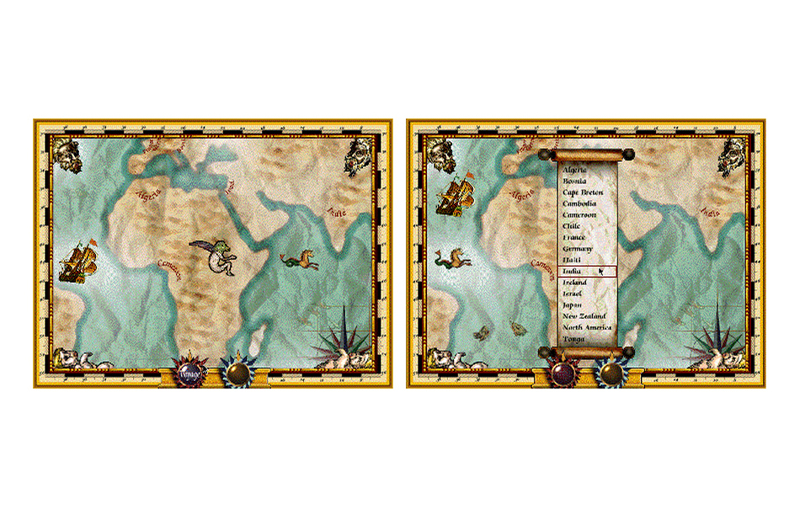 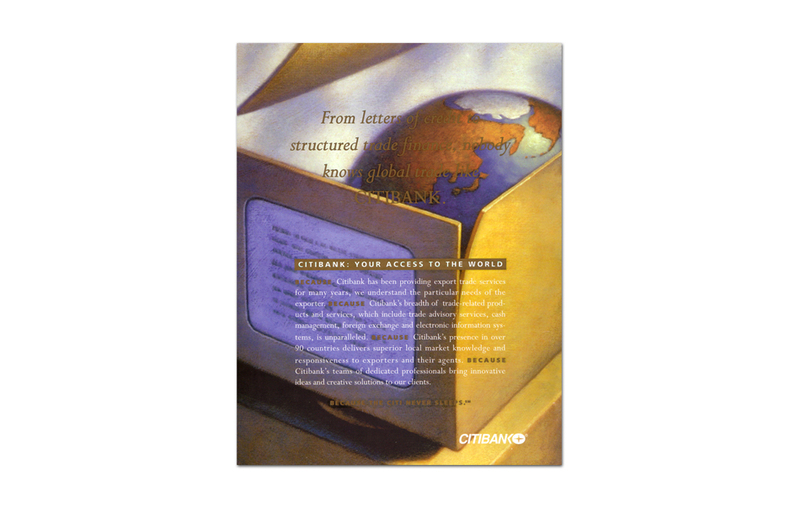 Early CDExtras were robust experiences pushing the limits of technology, content and physical disc space. 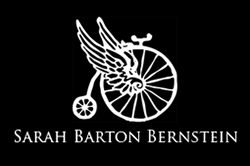 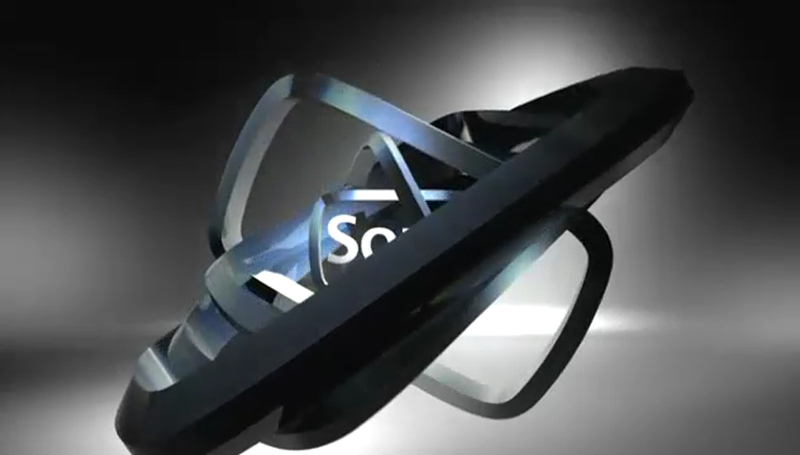 During my time with Sony Music I have designed and produced over 600 titles ranging from Ozzy Osbourne, Ryuichi Sakamoto, Harry Connick Jr. to Yo Yo Ma. 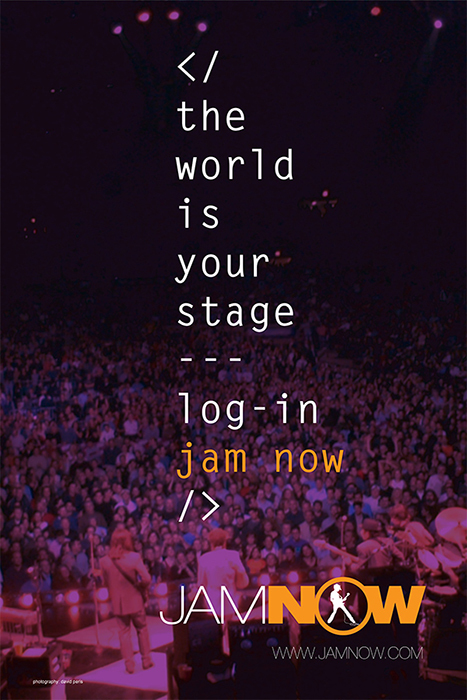 Working with an amazing team of programmers and artists we were able to produce unique experiences, reinforcing the band’s imaging and brand. 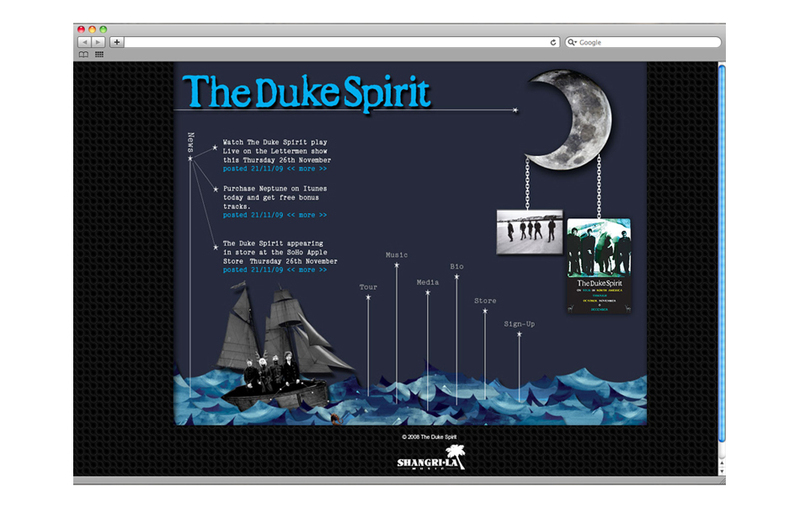 By adding unique interactive content and video CDExtras helped build affinity with fans, provided added value and expanded the musical experience. 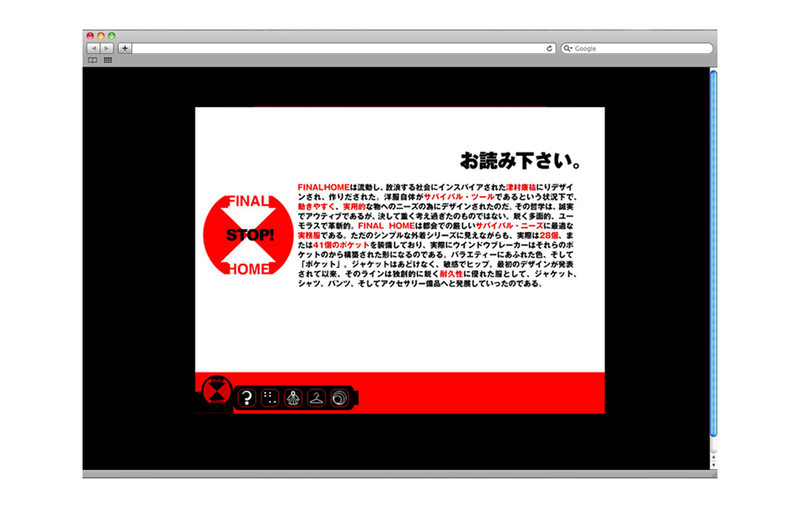 Final Home is a clothing brand developed by Kosuke Tsumura for Issey Miyake. 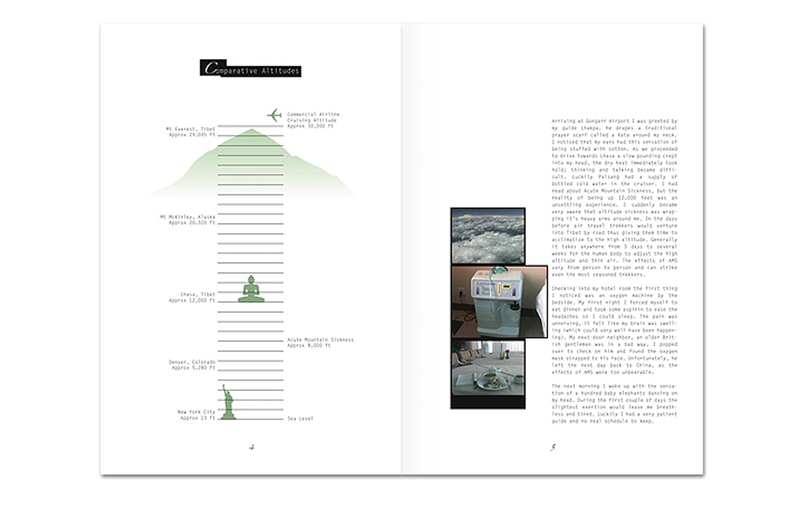 The concept of Final Home is rooted around urban survival, functionality and recycle-ability. 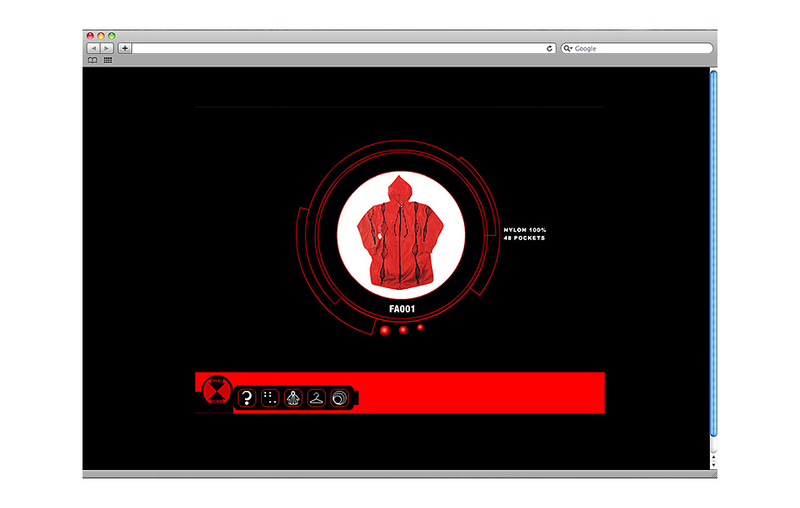 Original Final Home jackets were designed with zippered pockets around the entire garment allowing the wearer to stuff insulation materials such as newspaper or bubble wrap, there by converting a light weight jacket into a parka. 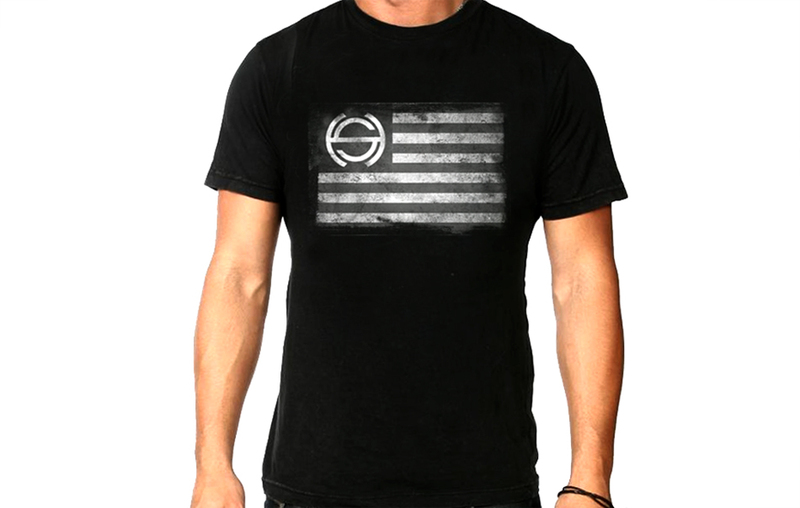 The design of the brand was youth oriented, closely aligned with club music and techno wear. 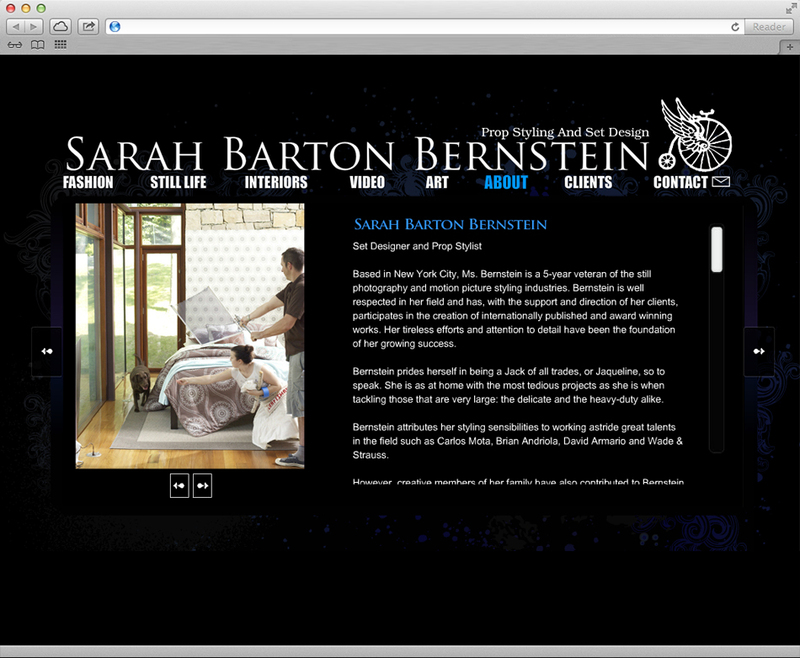 Ultimately the brand would branch out to include home furnishings and accessories. 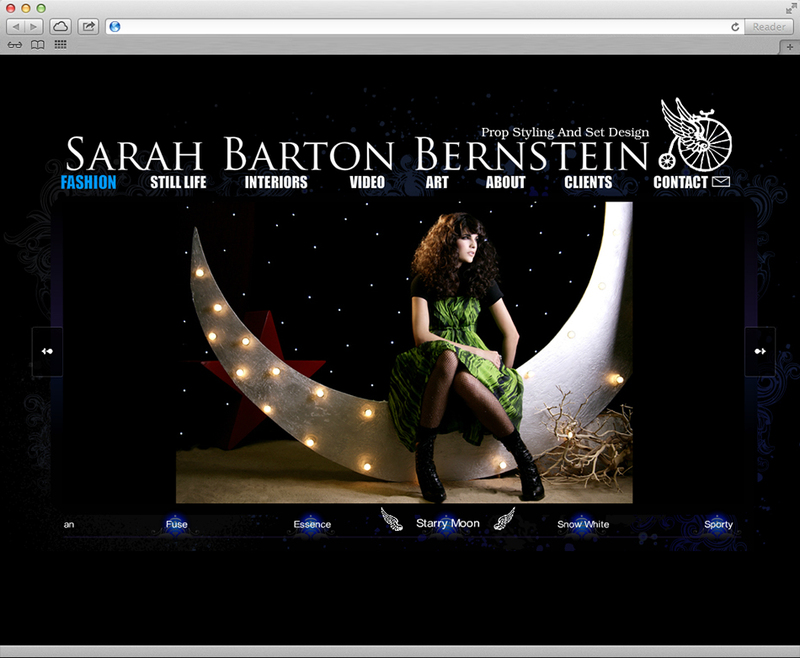 The website was built for the brand launch, timed around Final Home’s retail opening in New York. 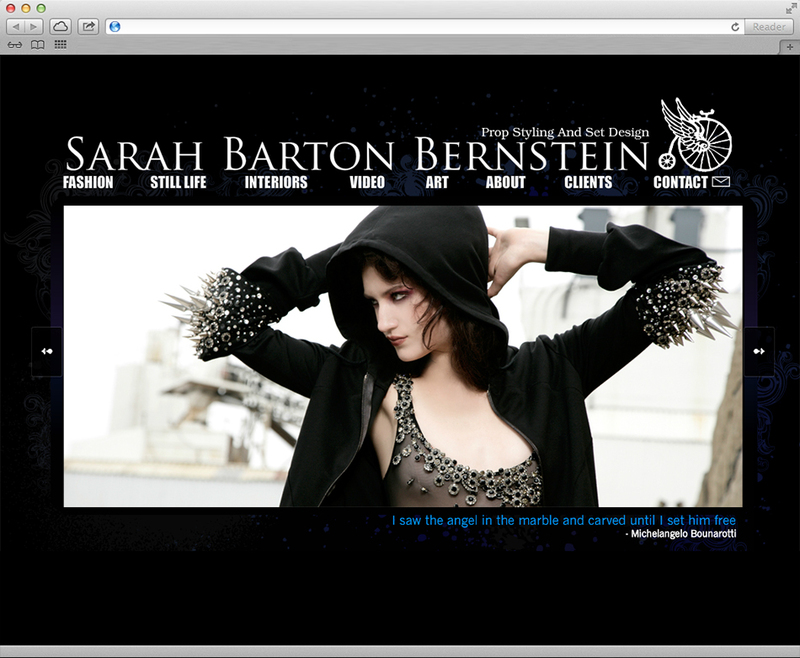 The site design echoed the aggressive and boldness of the clothing, providing a strong statement for its launch. 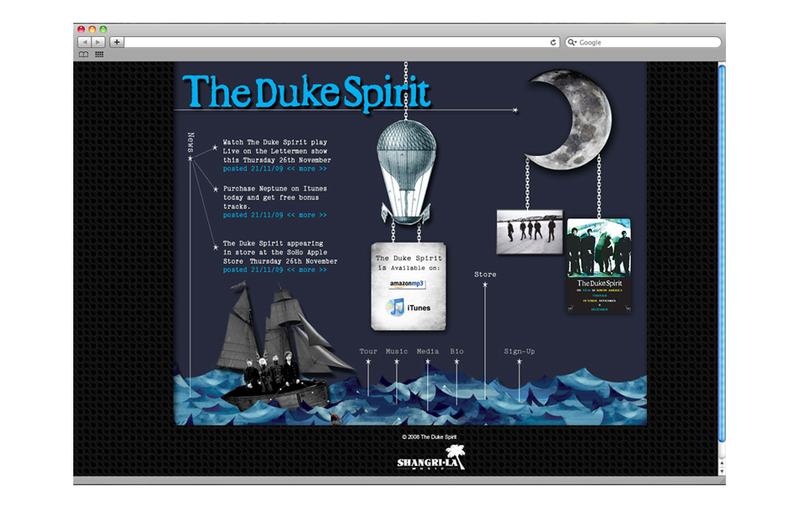 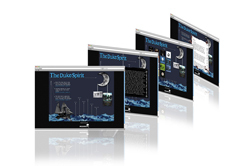 Downloadable eCards, catalogs, wallpaper and music mixers added a playful tone that extended the user experience beyond the website. 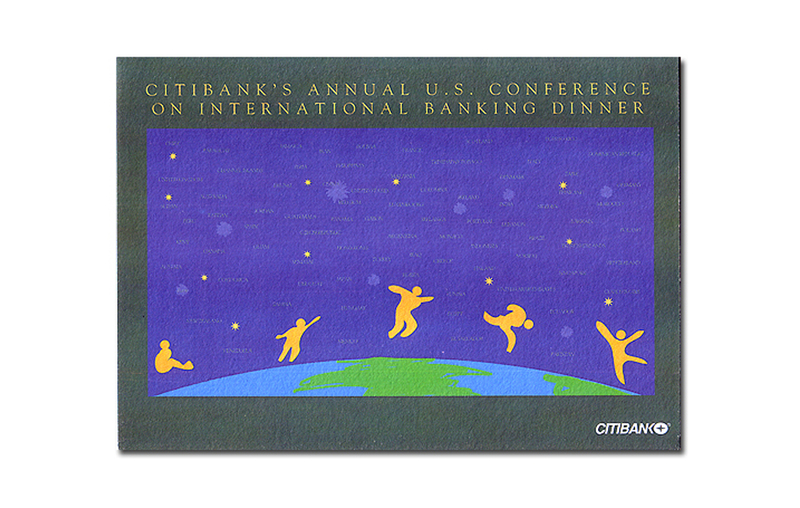 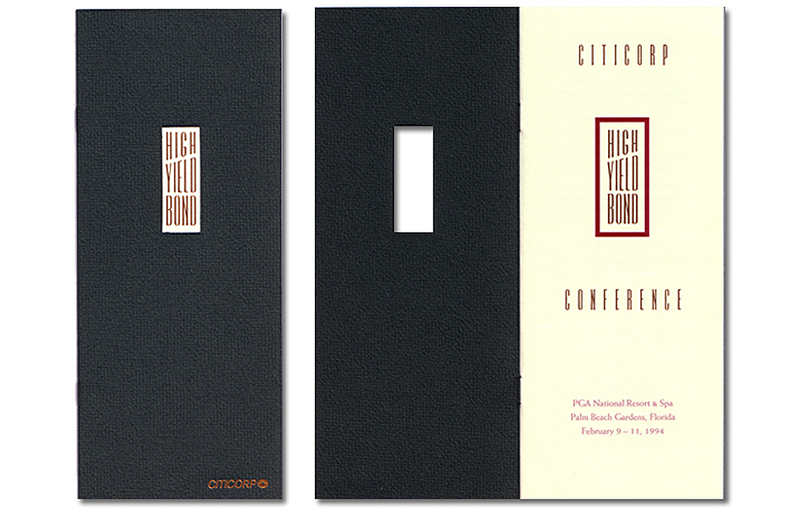 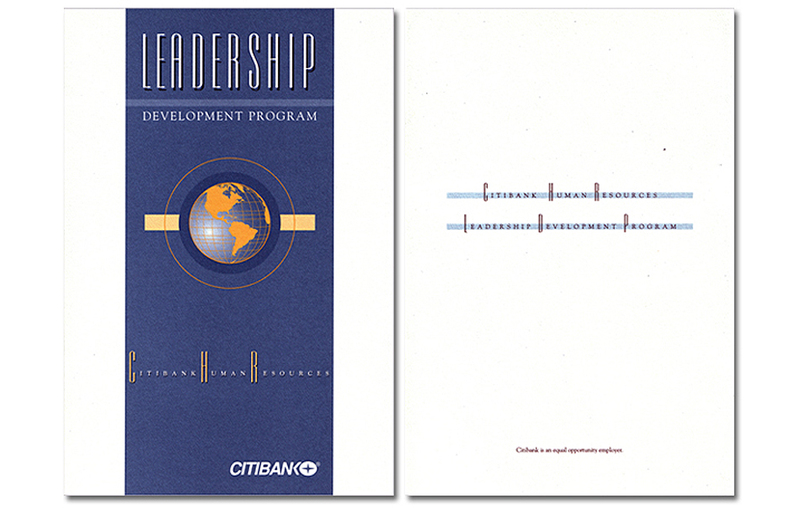 The following work was done during what I like to call the golden age of corporate print design. 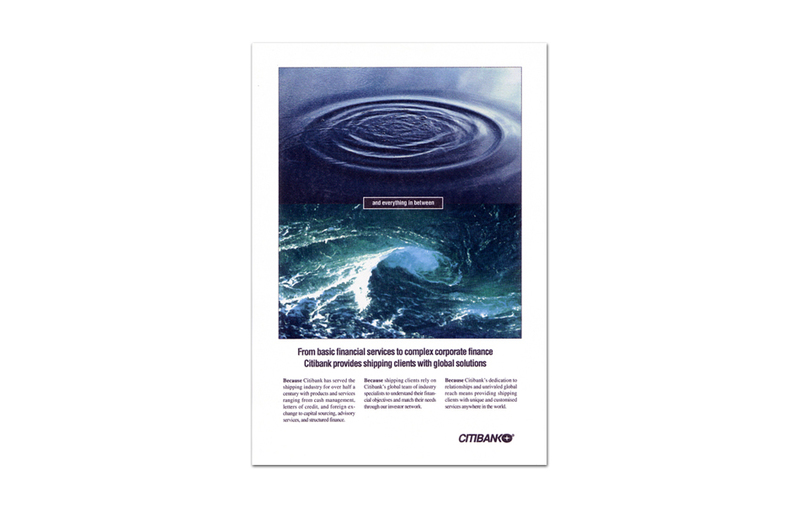 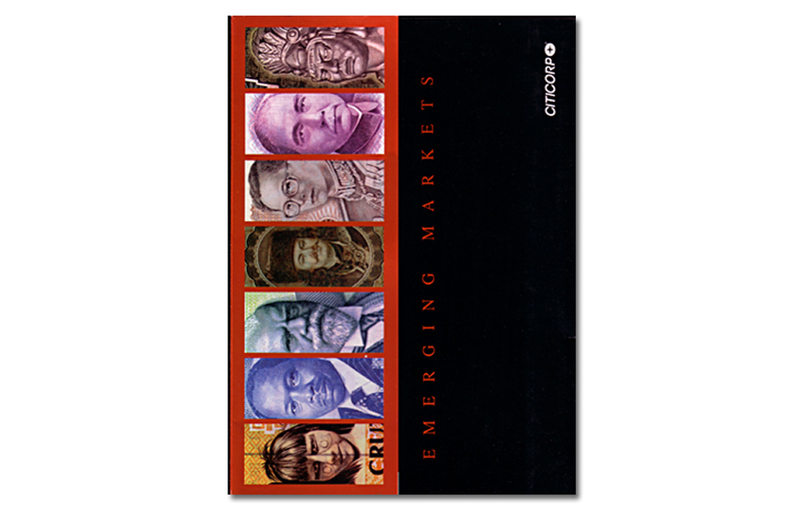 A time when financial printing was a booming business and budgets for annual reports and corporate events could afford high quality print productions. 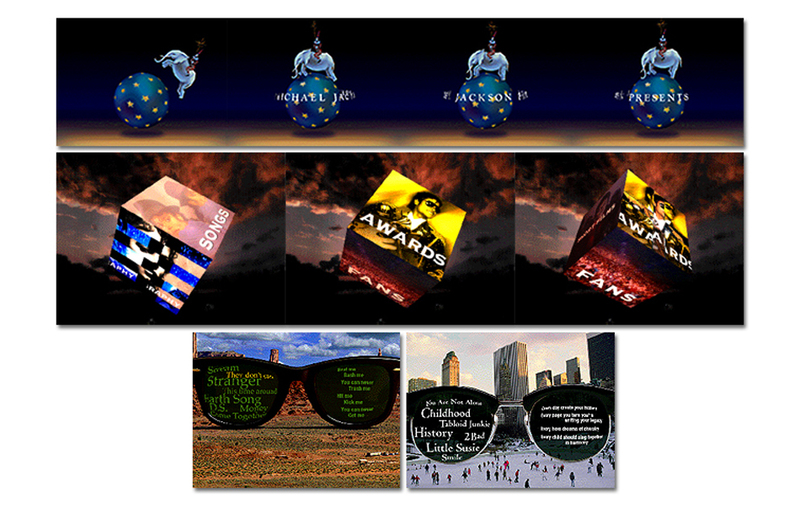 Working as the in-house design group, we provided cost effective, high quality design services that encompassed corporate brochures, print advertising to complete event materials (signage, programs, etc). 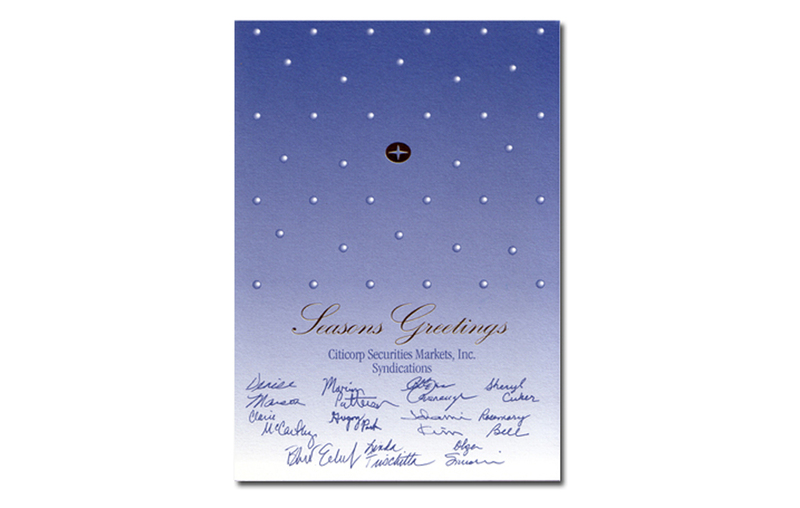 I had the privilege of working with some of the finest printers and engravers. 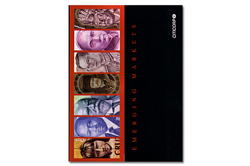 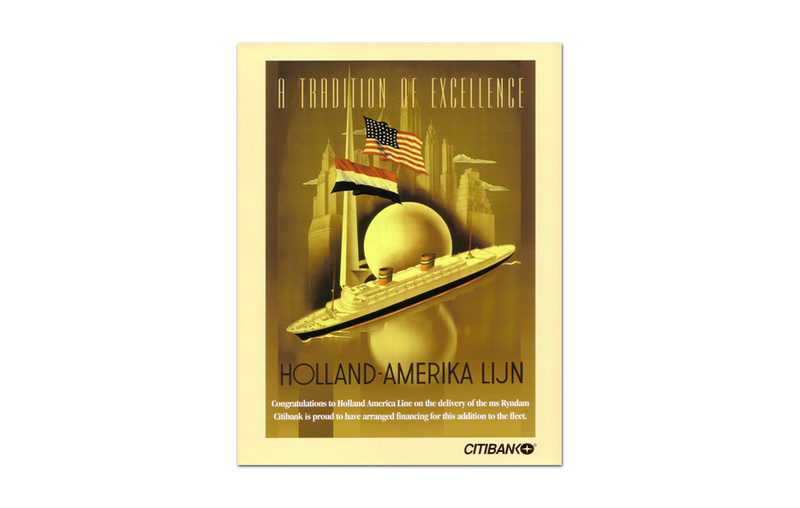 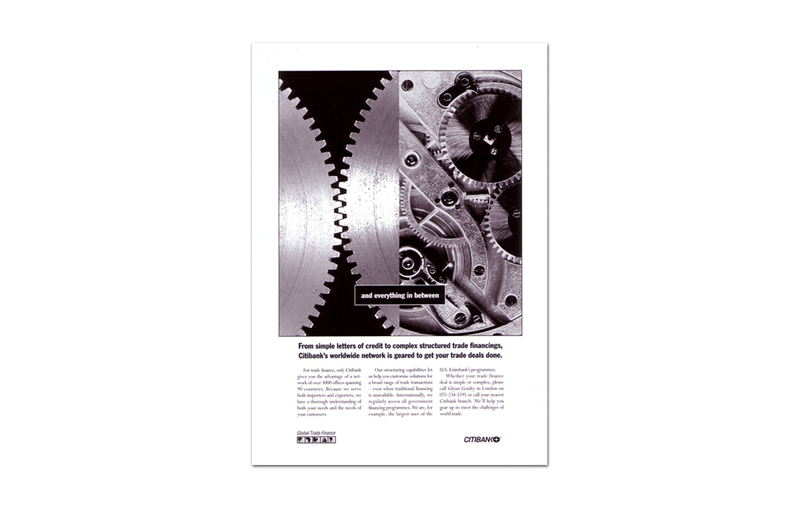 This was also an exciting transition period in print design, as we worked closely with printers and linotronic output houses in experimenting with early plateless, on-demand printing techniques and environmentally friendly materials.